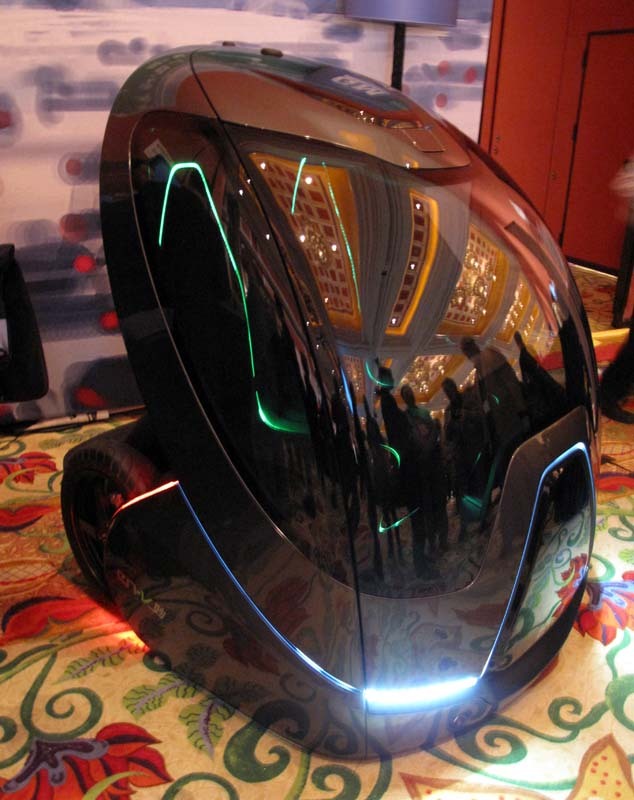 CES was back to full force this year, with attendance estimated at 140,000. We had time to cover only a portion of the show, and had to omit certain categories. One such category was the 80 or so tablets everyone introduced. Amazing the influence Apple has on CES without ever having a booth here. Too bad this part of the industry has no imagination. Another category is phones, which we cover during CTIA. 3D continues to be a major theme. This year we saw 3D spread into every corner of the show. We cover 3D in much more depth in our 3D Entertainment report. Other themes? 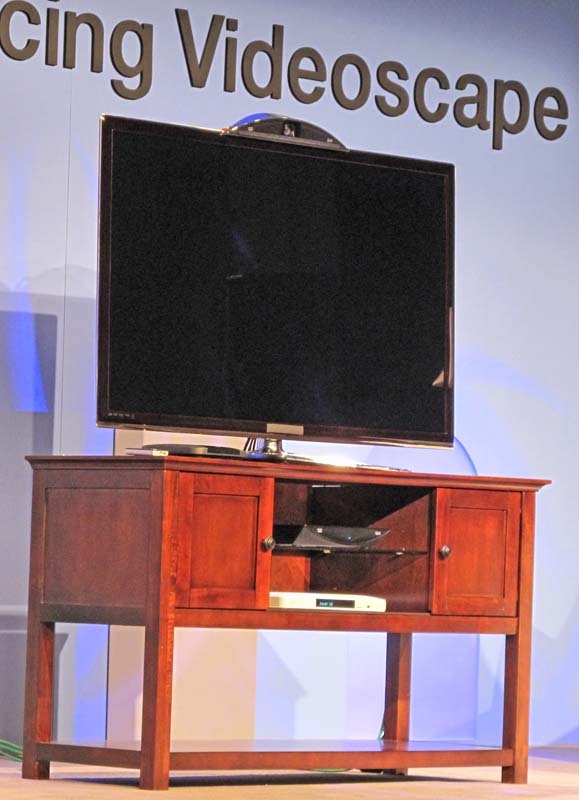 We continue to see consumer electronics invade just about anything found in the home. Even your door knobs, light bulbs, backpacks, and milk. And, they do it with "green". While last year saw a proliferation of iPhone accessories, this year we find them made for your iPad, too. 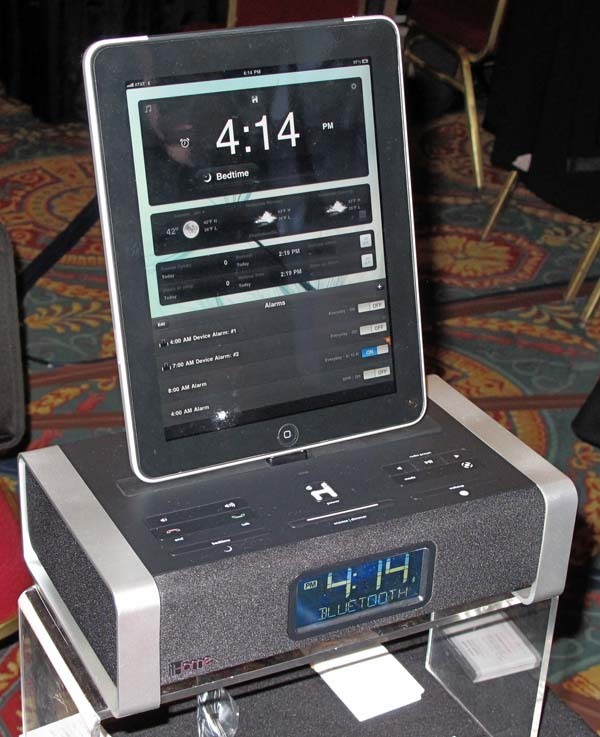 To the left we have the iA100 clock from iHome. It does the usual things that you'd expect. Cost is $199. Used to be difficult to record full 1080p at 60fps in expensive camcorders. Now you can wear one on your wrist. Shown here is the ATC9K from Oregon Scientific. $299 for the basic unit. Add a GPS module for geocoding your video for $70 more. 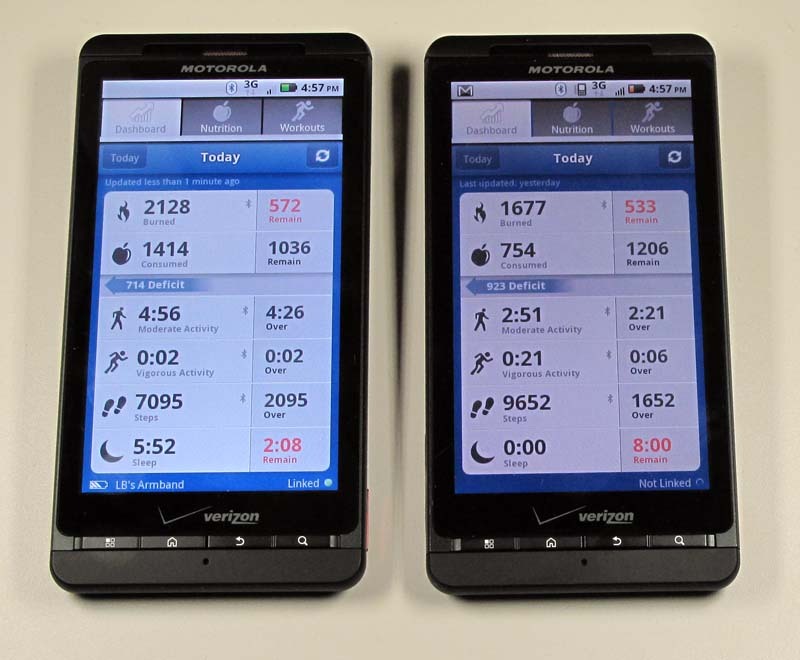 The iPhone and other smartphones are increasingly being used as a user interface for various devices. Here we have a blood pressure monitor from Withings that communicates to your phone to display and record your measurements for $129. They have a bathroom scale, too, for $159. When are trekking across the wilderness and you just have to update your Facebook page or send out a tweet that you just got bit by a snake, now you can do so via you smartphone and a link to satellite communications. Spot Connect sells this small device for $169, and various data plans (e.g. $29 for 100 messages, $50 for 500 msgs). And, if your phone runs out of juice as you are trekking, you might want to bring your charging iPhone case from Mophile. A 1500 mA hr unit is $80 and a 2000mA hr unit is $100. 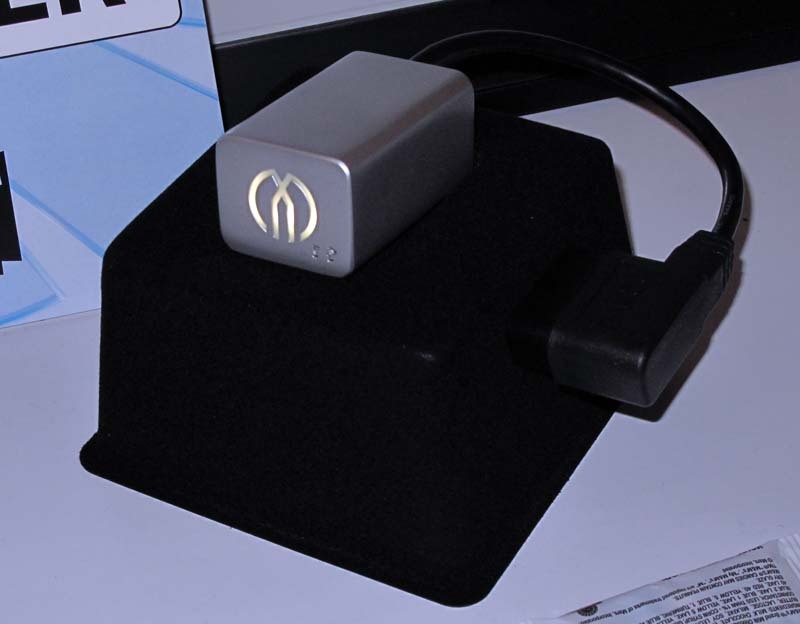 It charges its own batteries via a USB link. Here is another way to use your iPhone. Wear this Bodymedia FIT on your arm wherever you go and know what your vitals are. The armband communicates with Bluetooth (a non-Bluetooth unit also exists). $250. Everyone has heard of noise canceling headsets. 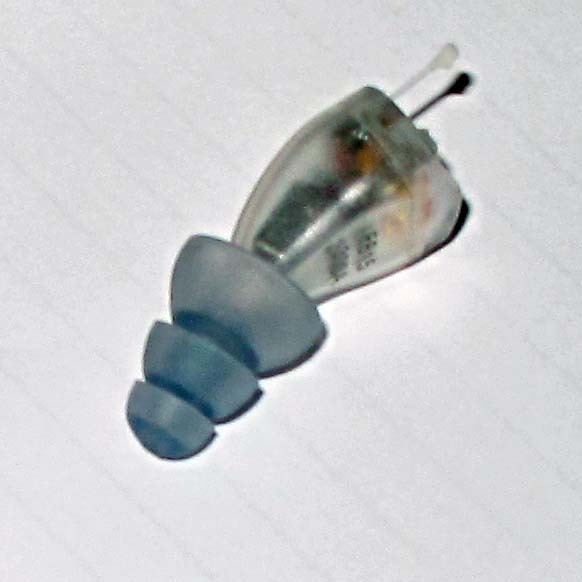 Trouble is, if you are hunter and you want to avoid ear damage from gun shot noise, yet hear the footsteps of nearby deer, you can't use these nor earplugs. In comes Etymotic with blast plugs that don't attenuate soft sounds, yet muffles blast noise above 120 dB. These are used in the military, but now you can own your own EB15 set for $495. Tremont Electric has taken a unique approach to charging up your portable devices. Instead of using the sun, this attaches to your backpack and uses your motion to charge things. It is called the nPower PEG and it sells for $159 As people get older we will continue to see devices and services like this one from PomDevices. 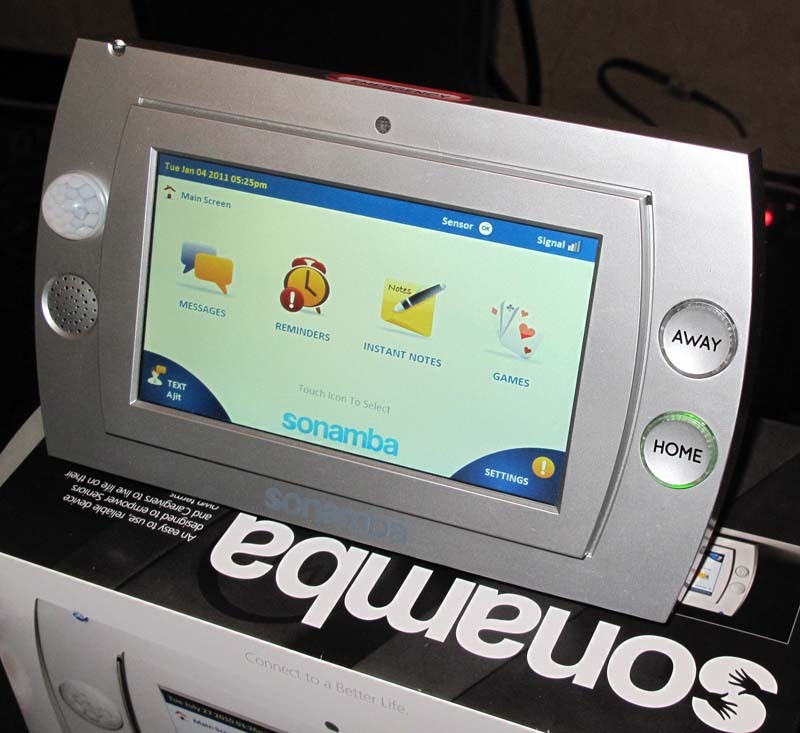 The Sonamba attempts to monitor seniors for activities in the home to determine if they are doing the usual things. If not, perhaps something is wrong, so it sends an alert. It also lets the senior's children send reminders and photos remotely. $549 for the device, $39/month for the service. 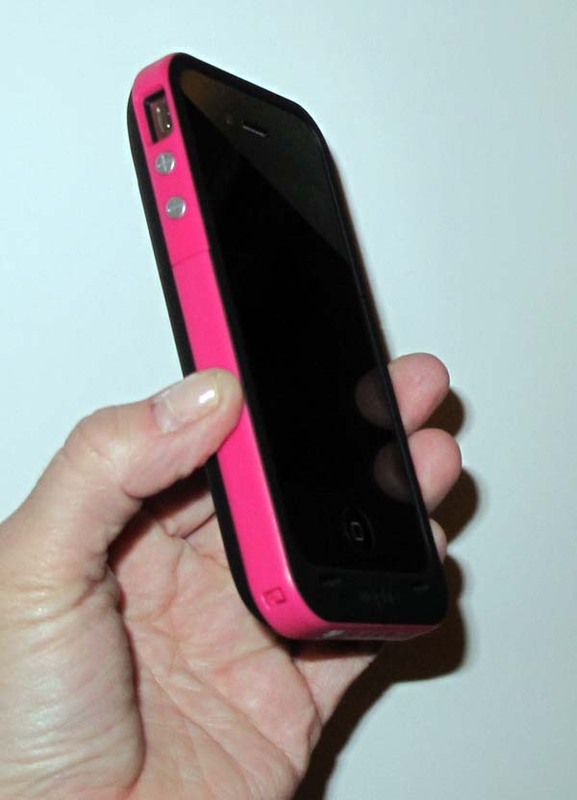 Remember the iPhone 4's "death grip" issue, where holding the phone a certain way seemed to attenuate the signal? 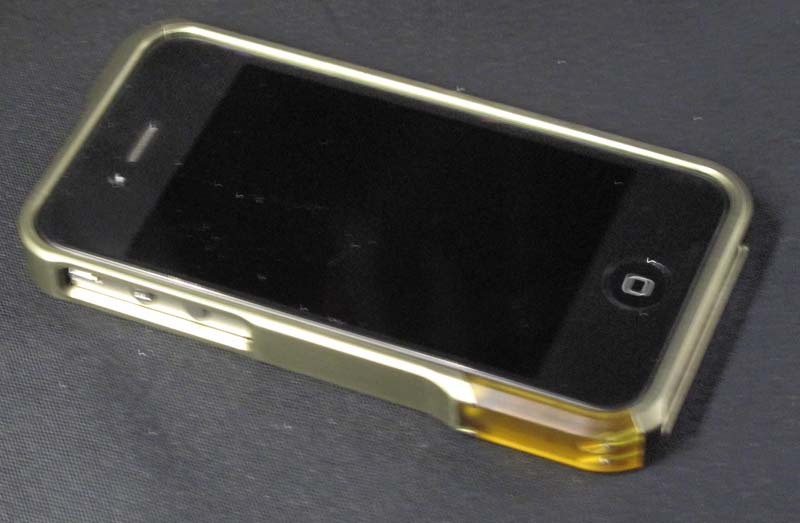 Metal iPhone cases can do the same, unless you buy one from Element Case. The one shown here comes out later in the year for something in the $100 - $200 range. Rubber padding provides protection, while milled aluminum is tough outside. Sometimes companies try to make products that attempt to combine every type of function one can think of. 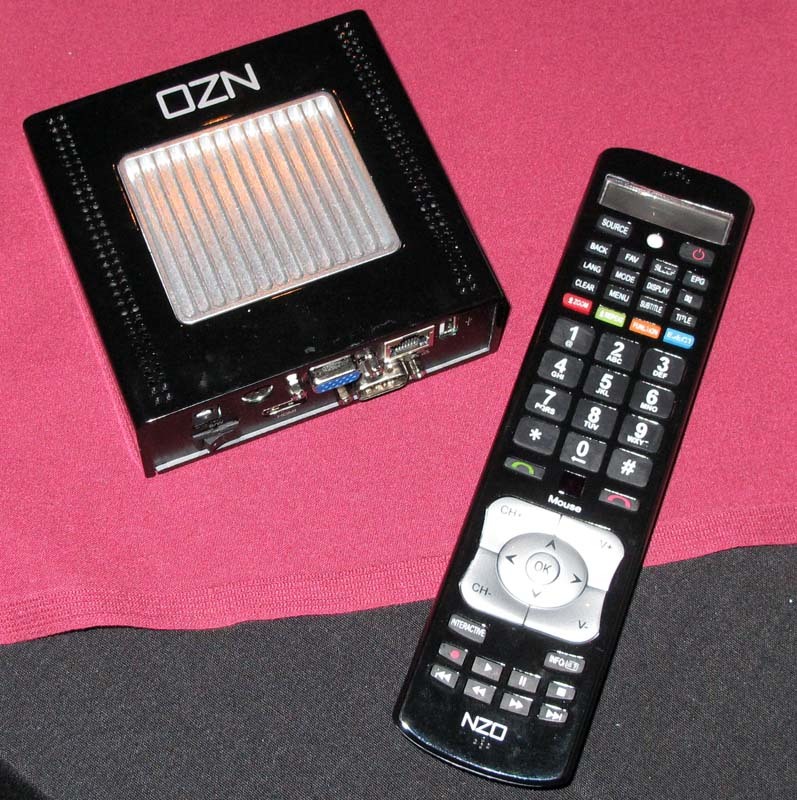 Here NZO (nzo.tv) has combined a VOIP phone into your TV remote control. 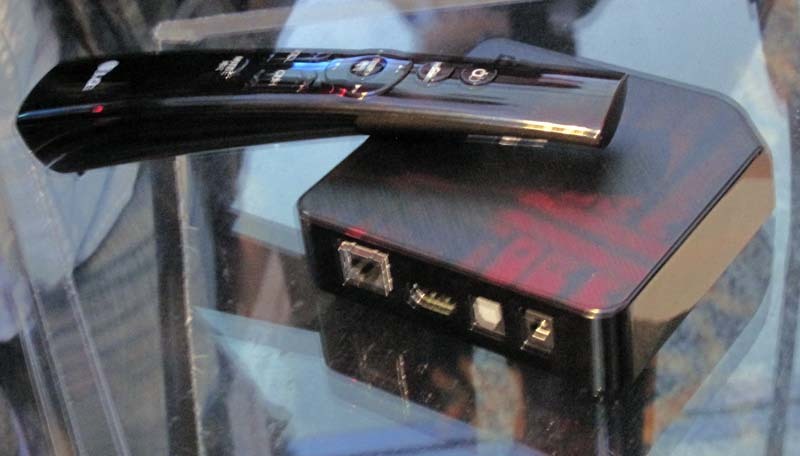 The Unitech remote costs $65 and the "Microbox" STB costs $129. 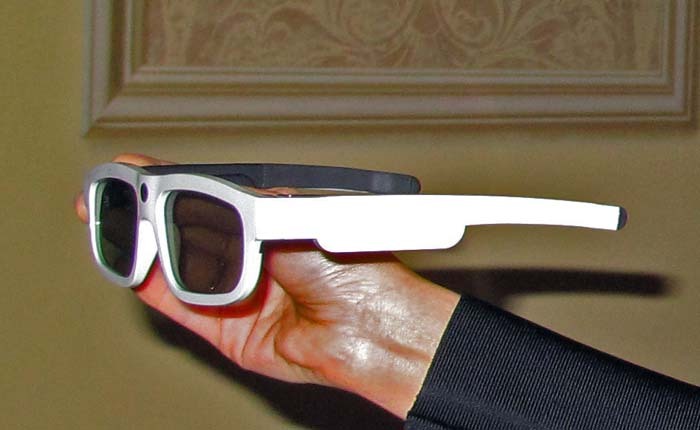 XpanD is a leading maker of active glasses used in theaters and now for consumers. This "Youniversal" set has a USB port for programming (via iPhone), RF link and power. Available in April, but no price yet. LG is extending a number of themes from last year. 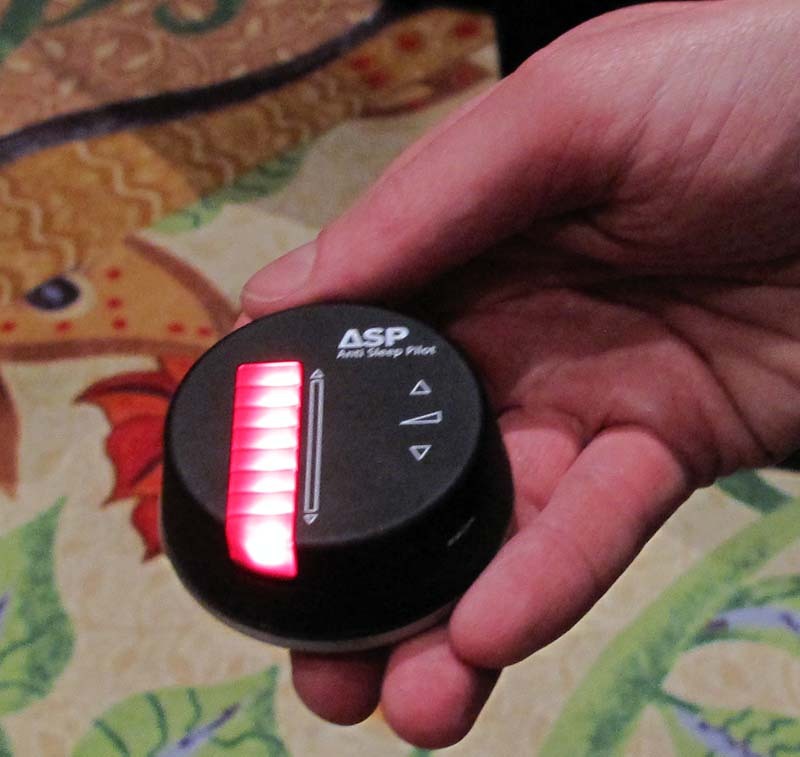 A relatively new item is a new remote control with acceleration sensors for moving a mouse pointer on the TV's UI so you can select Apps and content. The box is a Media Link "Upgrader" that plugs into an HDMI port to give your non-LG TV an LG experience (apps and content). NetGear is always about speeds and feeds. 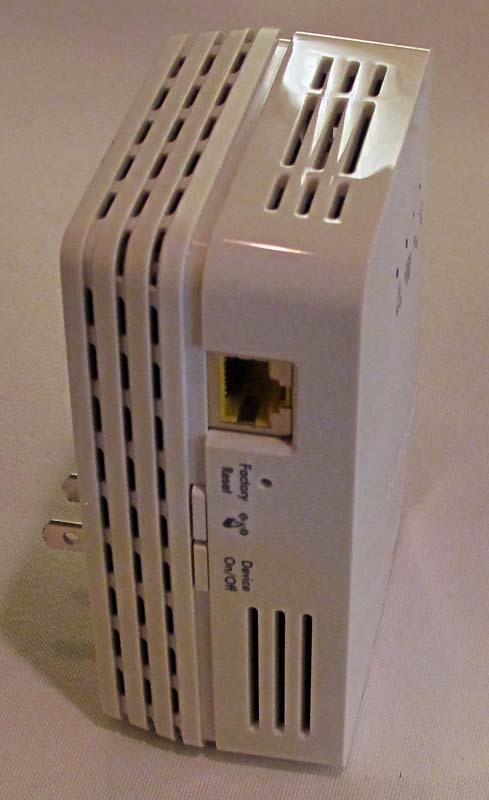 Here we have a WiFi repeater that you can discretely plug into the wall to extend the reach of your base WiFi link. While introduced last year at IDF, Intel's "2nd generation" processor has integrated graphics that take advantage of a more direct link to the main CPU. Great for notebooks, but also for desktops, this nearly 1 billion transistor chip (held in photo) claims to beat at least half the dedicated graphics cards out there. 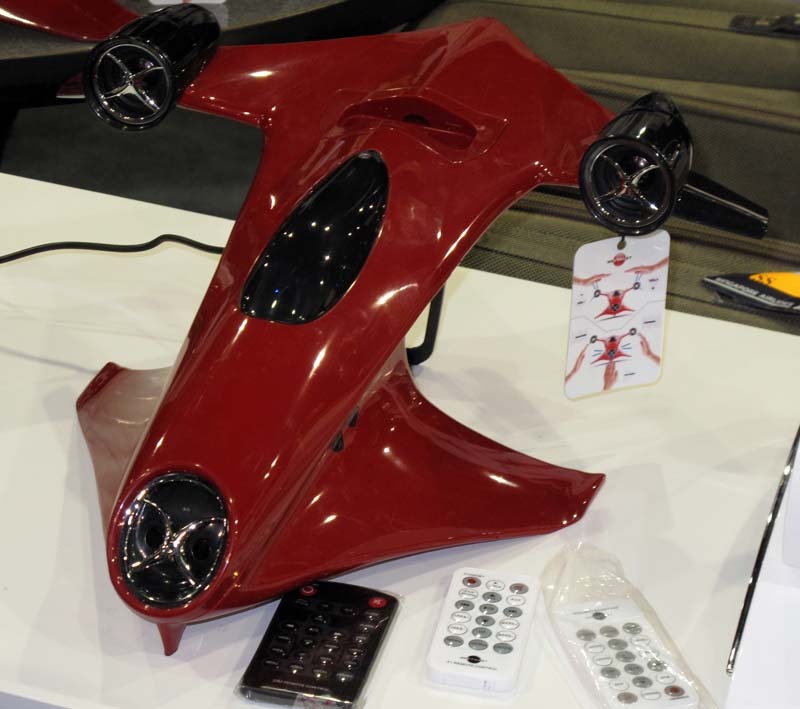 Consumer 3D continues evolving at CES. 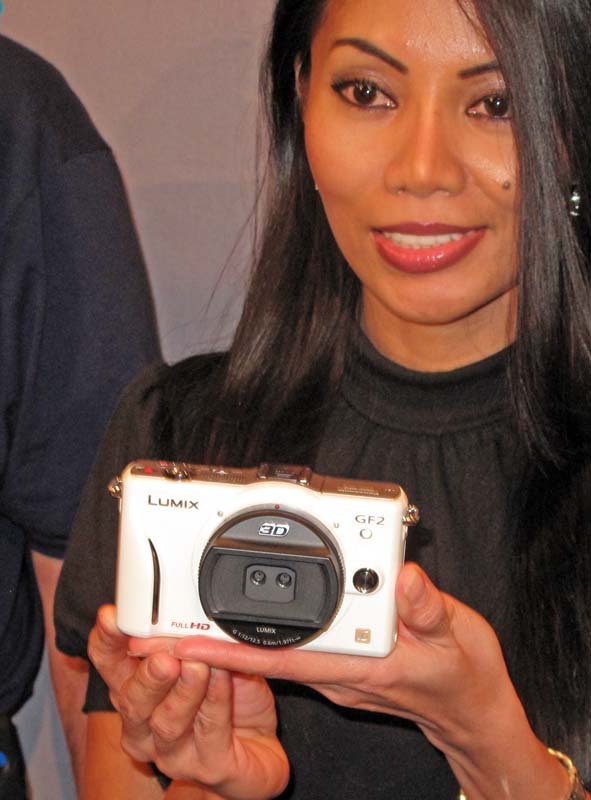 Here we have Panasonic's new Lumix 3D camera. 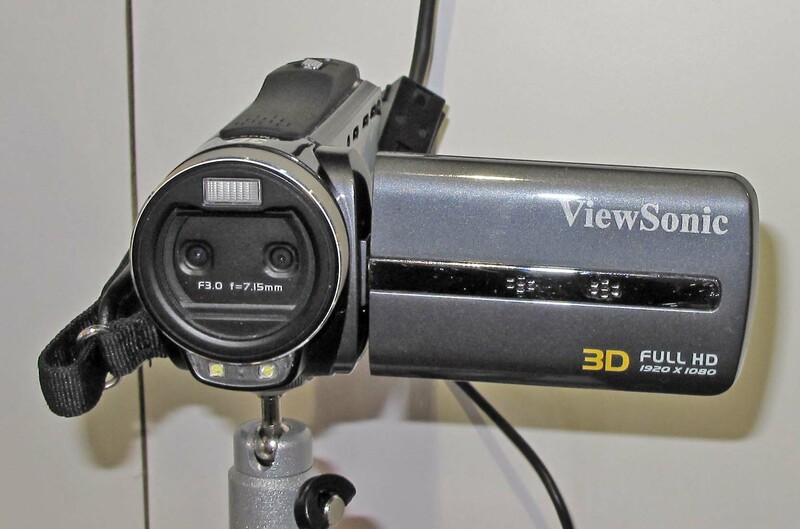 Actually, in a manner that is similar to their consumer 3D camcorder, this 2D camera has a special lens for 3D on it. 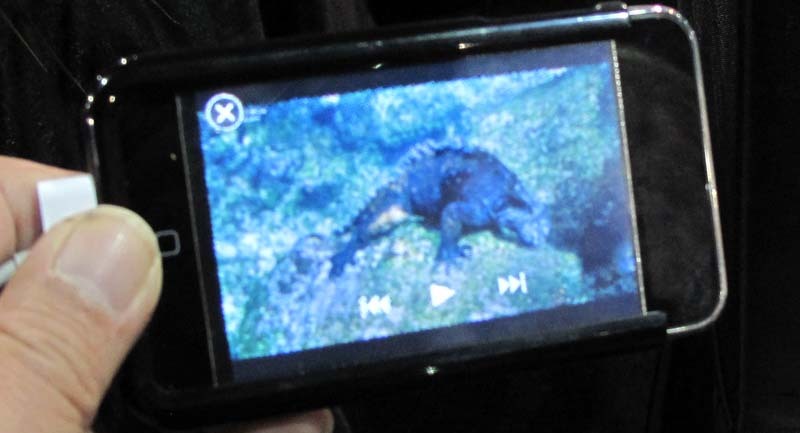 3D photos can be viewed by putting the SD card from the camera into an SD slot in Panasonic TVs and players. 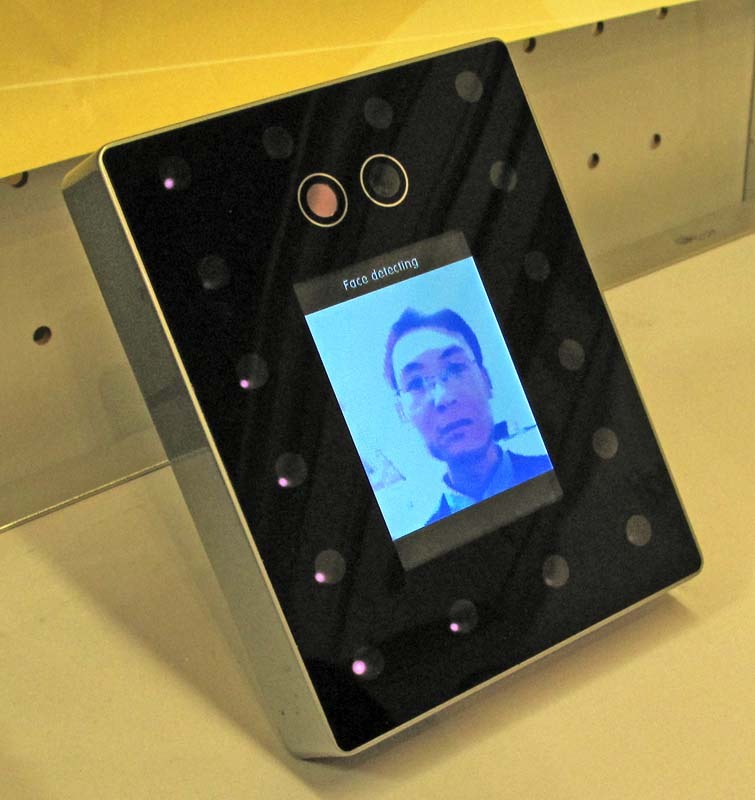 Cisco introduced their consumer telepresence product called UMI (You-Me) a little while ago. 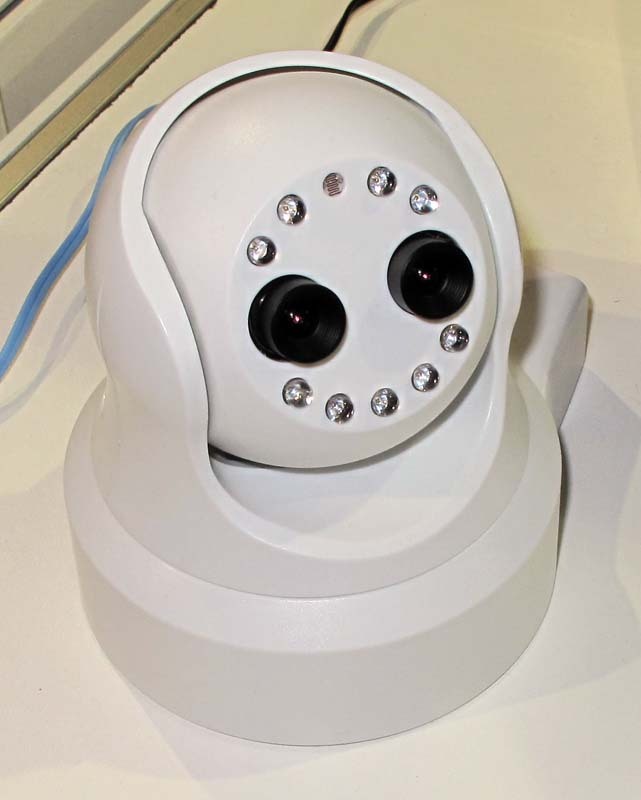 The camera sits atop a TV and works with a Cisco box below it. Video quality is quite good if you are used to what Skype provides. Every once in a while a new product is introduced that breaks the old CE mold without being some kind of gimmick. 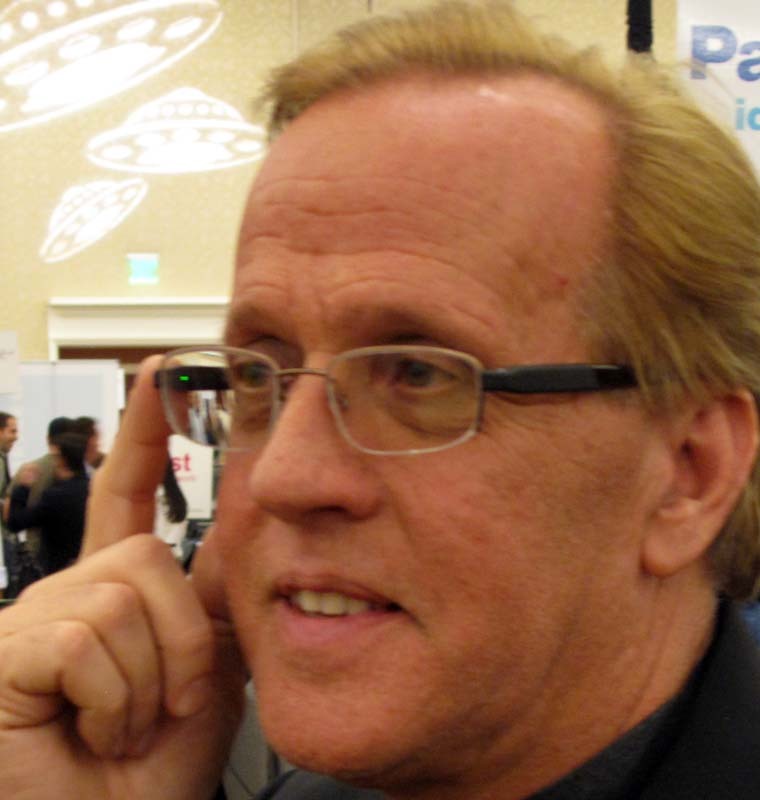 Such is the case for Pixel Optics and their electronic glasses. By embedding a liquid crystal layer on part of the lens, these glasses change from regular near-sighted lenses to bifocal lenses. So, the wearer doesn't get any distortion when viewing distant objects, yet can read close objects when needed. A touch of the frame (see photo) switches the lens mode. Look closely at the photo and you see a small green indicator light that tells you it is reading mode. If you swipe the frame control, the glasses will automatically switch to reading mode when you tilt your head down. The frame is charged by an inductive charger. 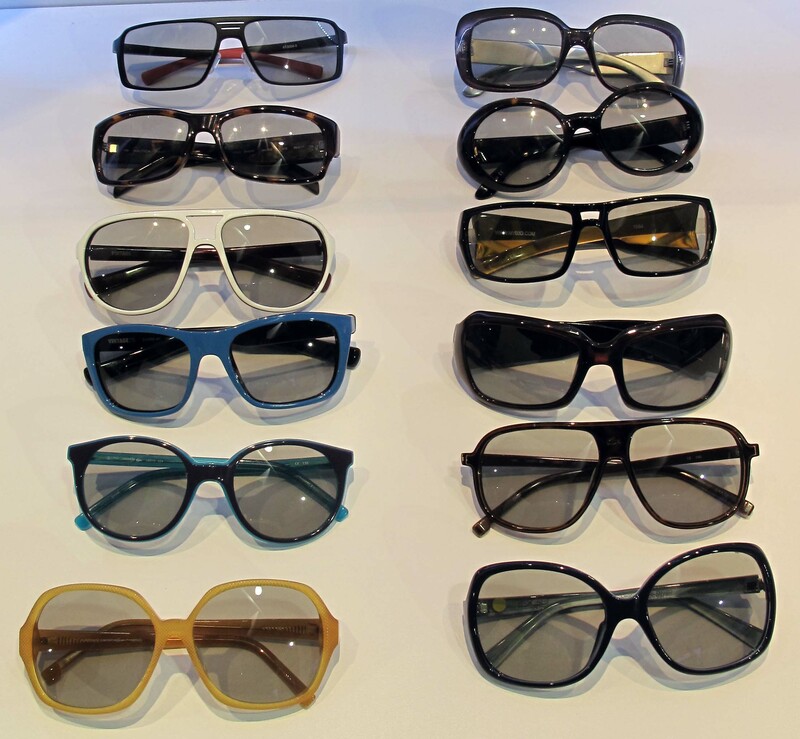 Expect them in April at a cost of about 25 to 30% premium over regular bifocal glasses. Now when Nike says "Just Do It", they can tell you what you just did. 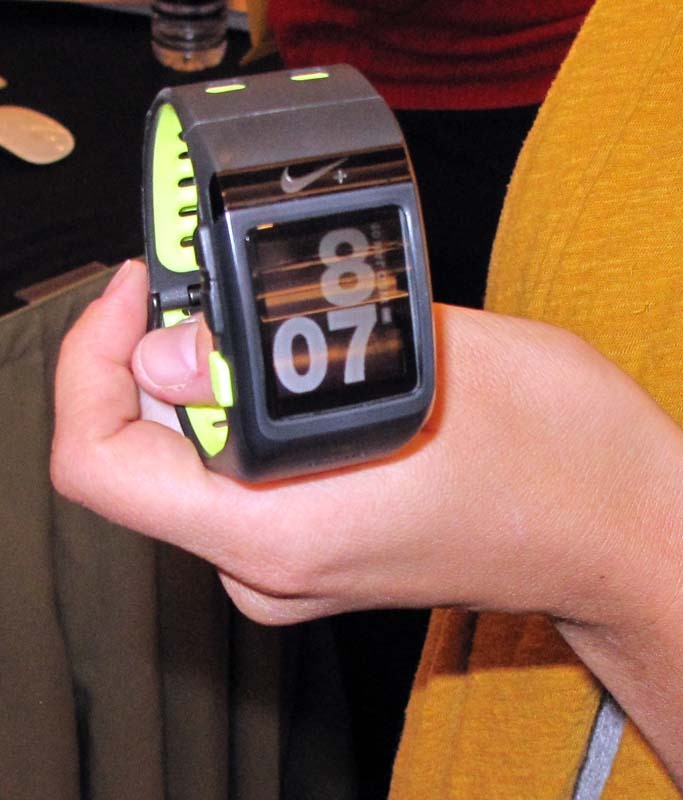 Wear this SportWatch GPS and collect your vitals and track where you ran. 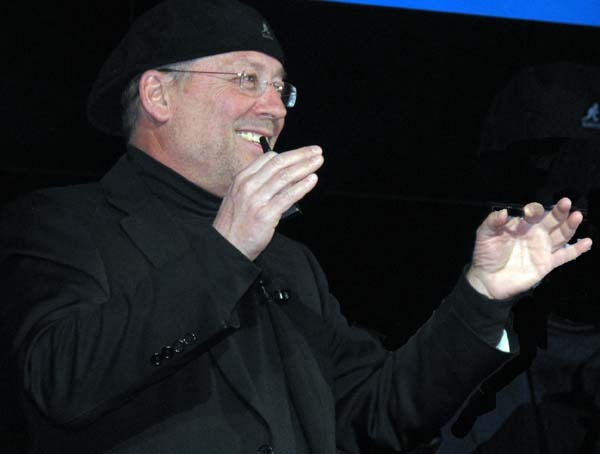 Tom Tom worked with Nike to make the mapping work. Price will be $200-$300 in April. 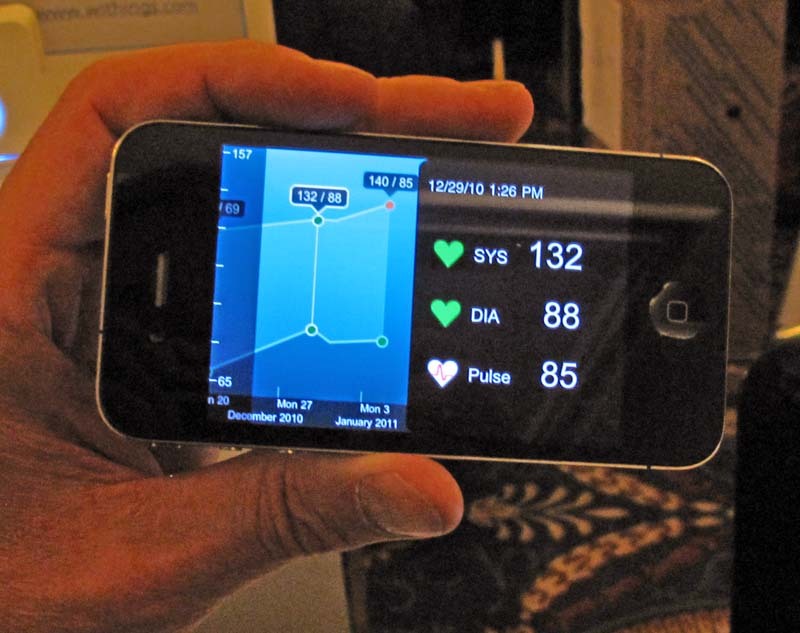 Another blood pressure meter, this time from iHealth. 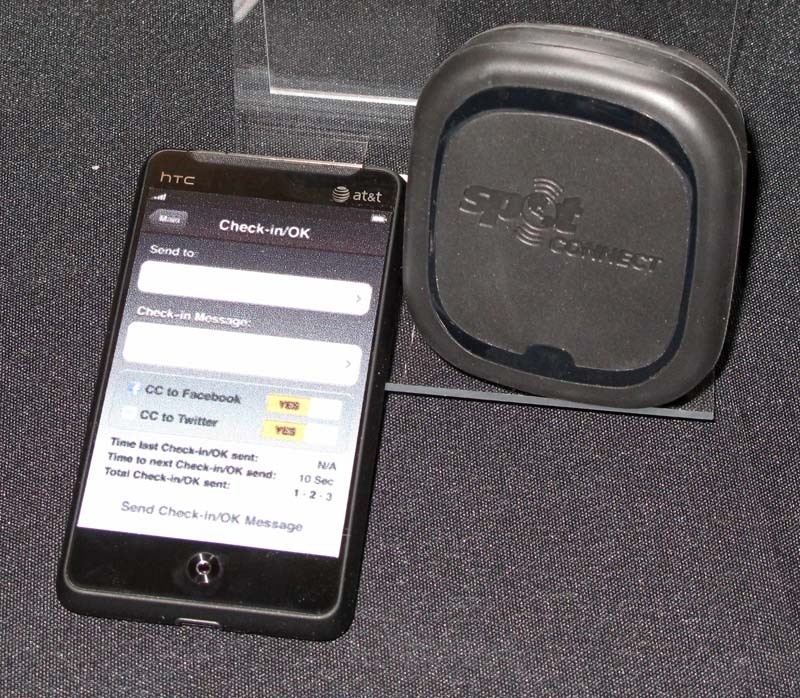 This unit communicates to your iPhone via the cradle (that also contrains the pump). $100. 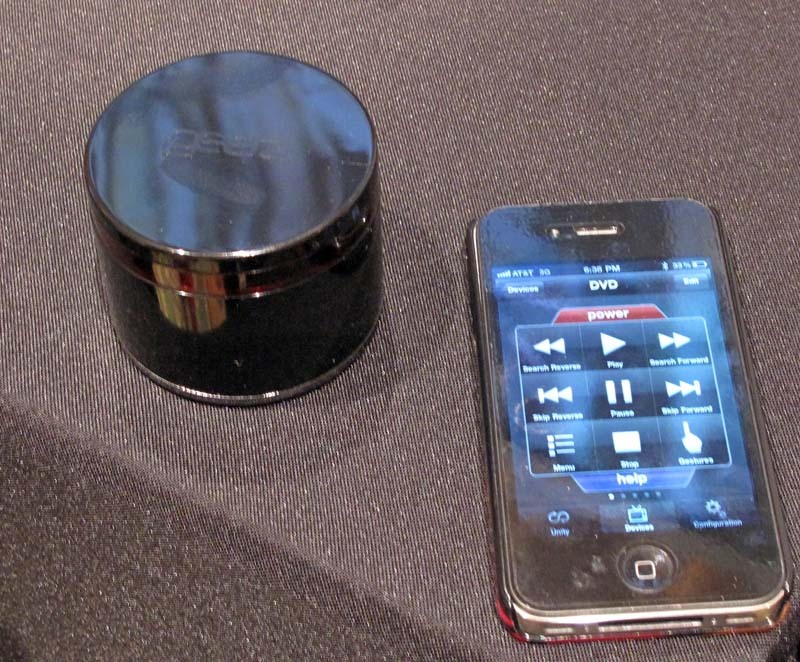 This product is a set of speakers that can play music from your iPhone or streams from Ethernet (WiFi or cabled). Circuitry enhances the sound for you. Bowers & Wilkins makes this Zeppelin Air AirPlay - March, $600 Look closely at the displays to the right. 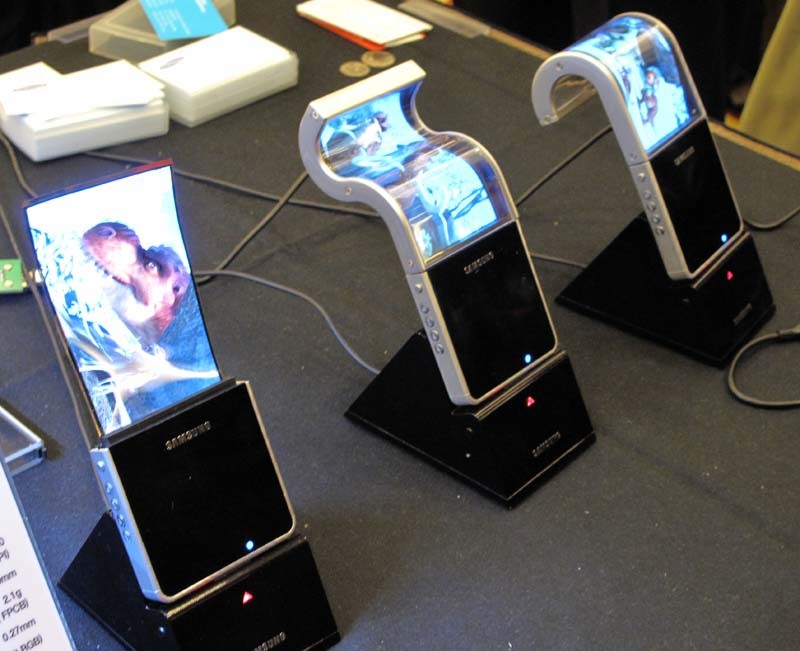 Samsung is showing how OLED displays can be flexible. You can bend these displays in as tight as a 1 cm radius. For iPhone (and other smartphone) users that miss that old handset feel, now you can plug in one of these Moshi Moshi (means 'hello' in Japan) handsets from Native Union for $30. They also have more stylish executive type handsets that are Bluetooth linked so you appear to have a cordless phone - $100. 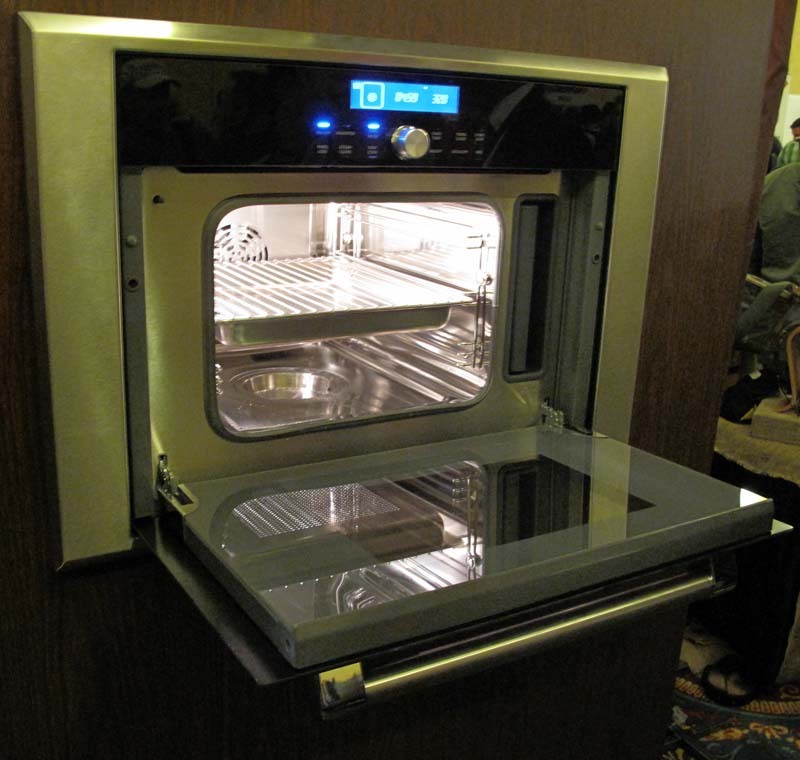 We close out the pre-CES show with the Steam Convection Oven from Thermador. Ever warm up food and have it come out dry? Steam heating solves your problems. Some professional cooks use this trick and now you, the consumer can too for $3K. Tired of those up/down/left/right keys on your remote? 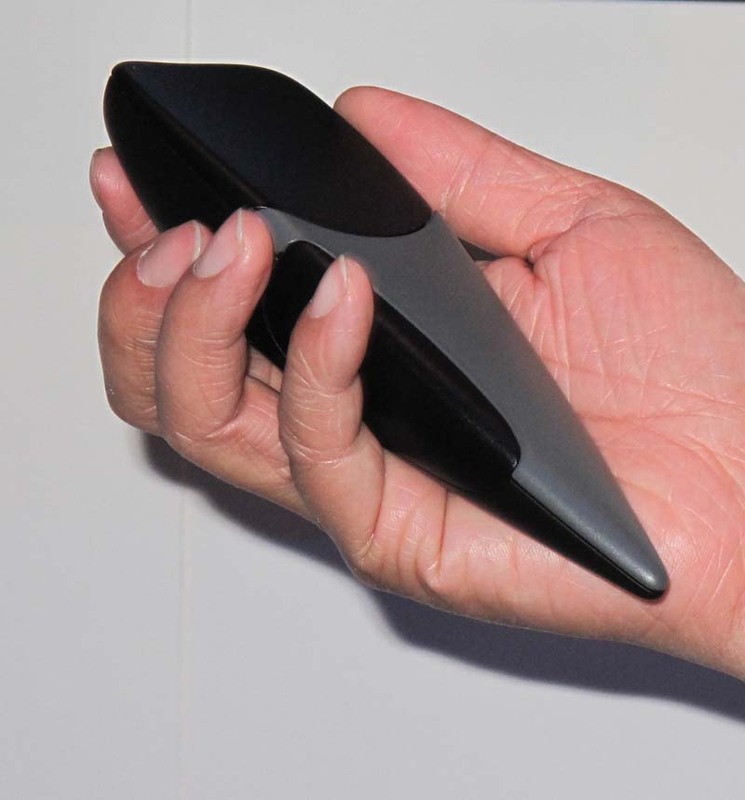 Panasonic showed off a remote that you wave in the air to point to things on your TV in 3D. Can't buy this, either, because it, to is a prototype. 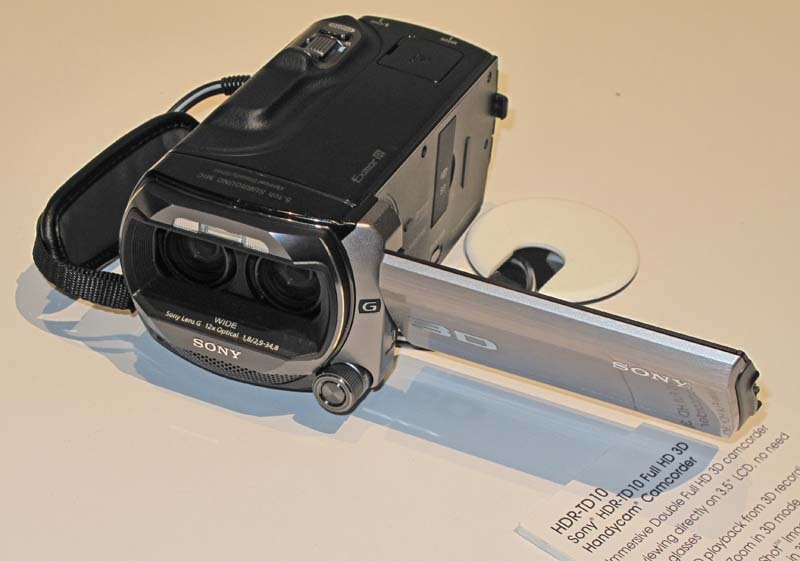 Here is the long rumored consumer 3D camcorder from Sony (HDR-TD10). 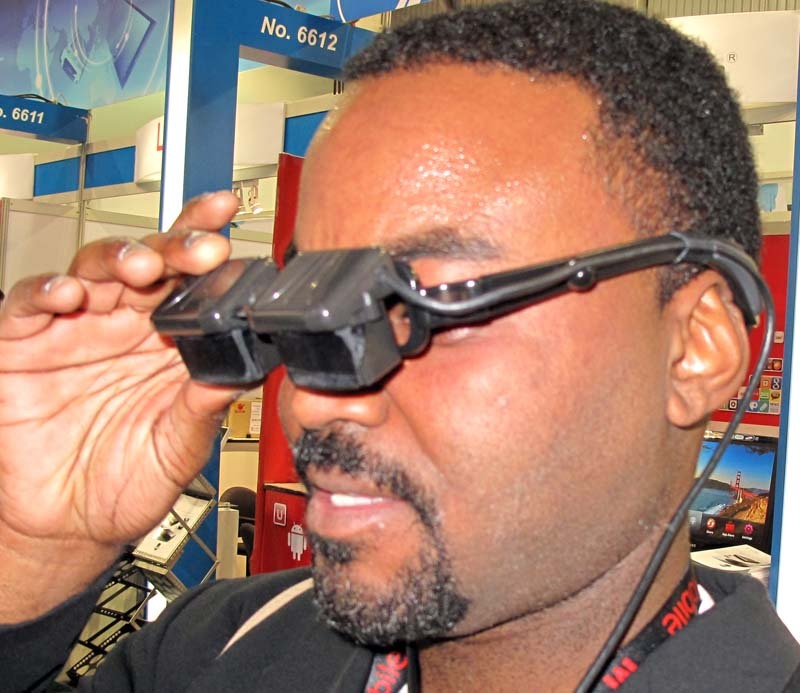 Relatively sophisticated video electronics and optics, including autostereoscopic monitor. Available in April for $1.5K. 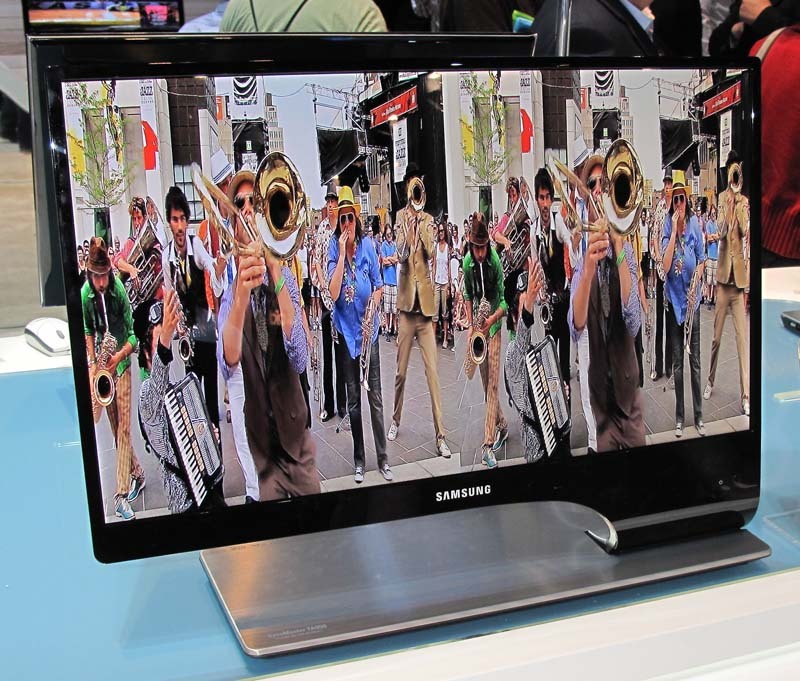 Aside from the stylish looks, this Samsung monitor automatically converts 2D images into 3D, real time. We've go opinions about this type of technology, but will save them for later. The model number is TA950, but no price yet. 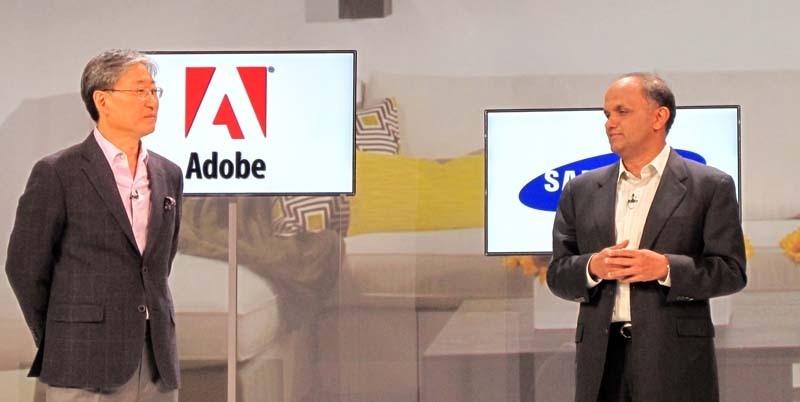 Speaking of Samsung, here we have their CEO (left) and Adobe's CEO (right) announcing Flash and Air for Samsung's TVs. Samsung has a big App Store, messaging, streaming media, etc. Sort of like a 75 inch iPhone, only with Flash. OK, what is this? When you wave your hand through the red beams you modulate the music that is playing. 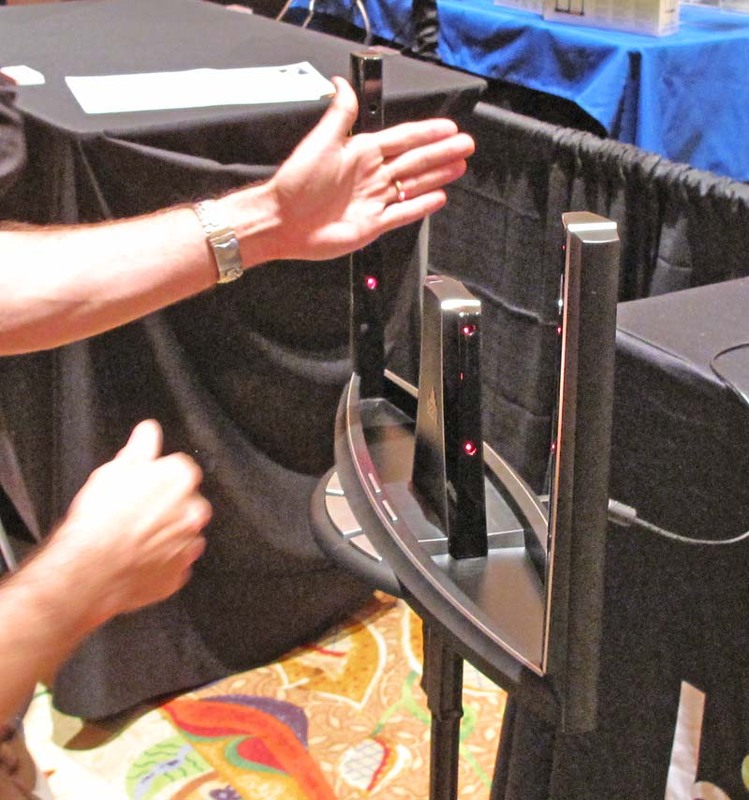 It comes from Beamz Interactive for $199. Can't do it justice here - you'll have to hear it yourself. GM showed off their en-V electric vehicle. It is running at the Shanghai Worlds Fair, but you can't buy it. Believe it or not, it only has 2 wheels. Runs 40 miles on a charge. Gear4 has their Unity Remote that replaces all of your remotes with your iPhone. 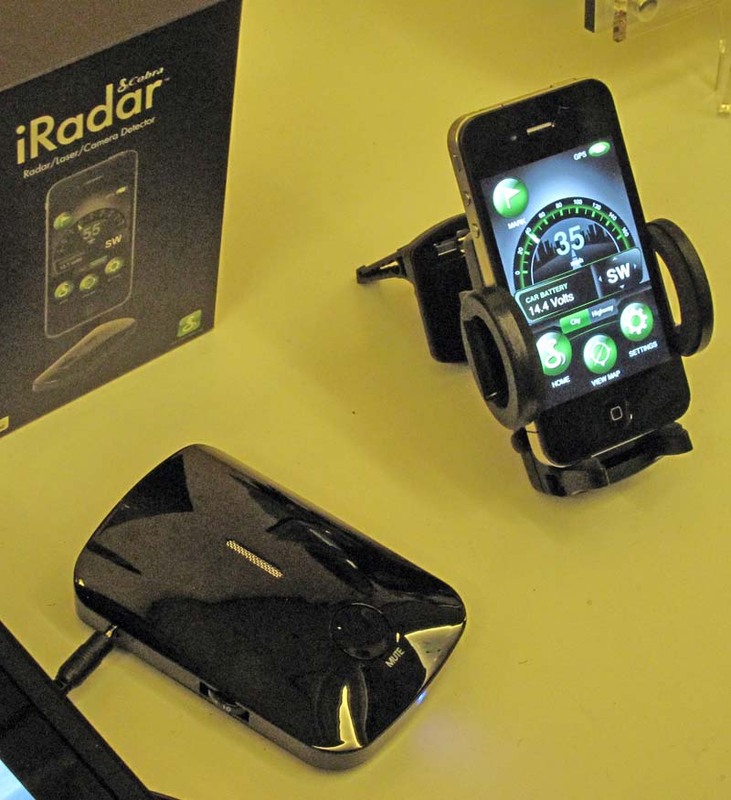 Place the IR blaster unit in the room and download the App and control everything. Just $99. Another quiz - what is this? Mindscape spent 15 minutes explaining it to me and I still not sure. 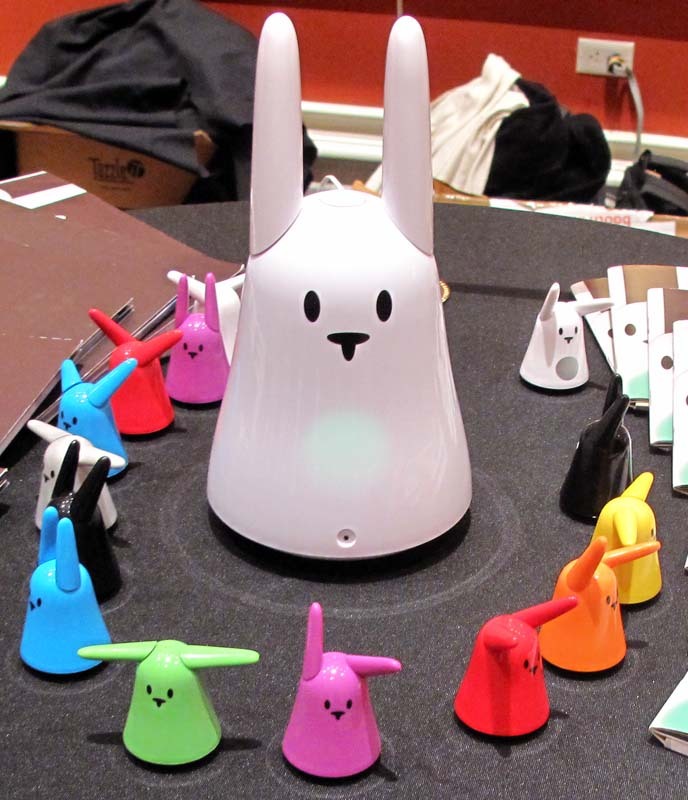 The Karotz unit in the middle does radio, RSS feeds, MP3, webcam, alarm, voice chat, information services, games and more (while wiggling its ears). The small units have RF tags that activate the Karotz. 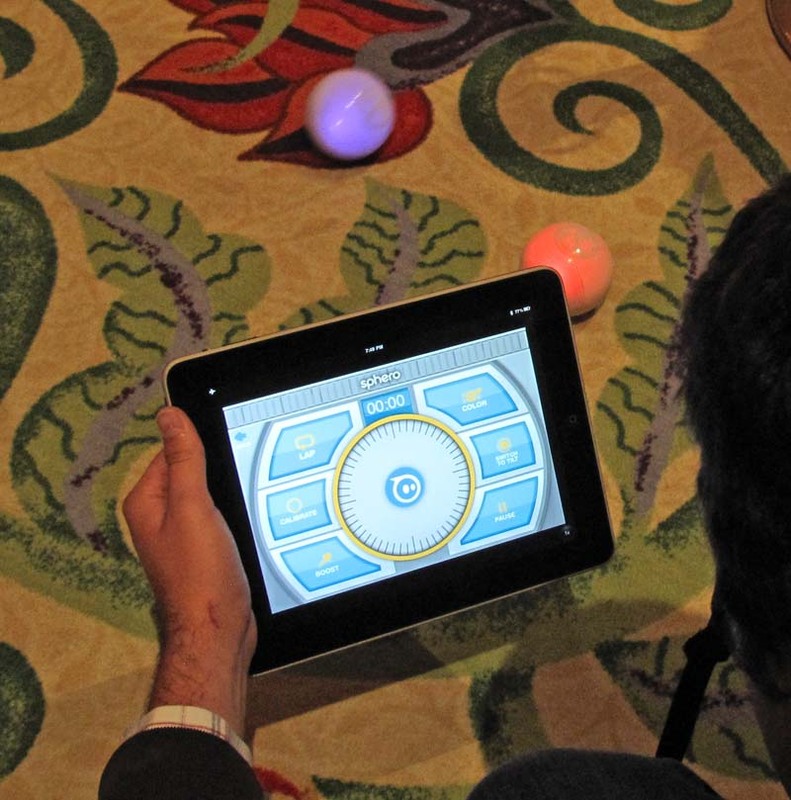 Buy it in April for $179 Sphero has a ball that lights up different colors and rolls around on your commands from your iPhone or iPad. Pure amusement. Sort of like the 2011 edition of a Pet Rock. Available in time for next holiday season for under $100. I've a friend that is about to sail around the world. 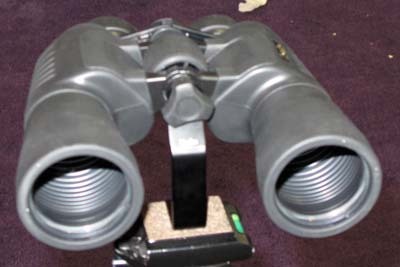 If someone goes overboard, better have one of these Scout PS32 units from FLIR to pick out the person in the waves. 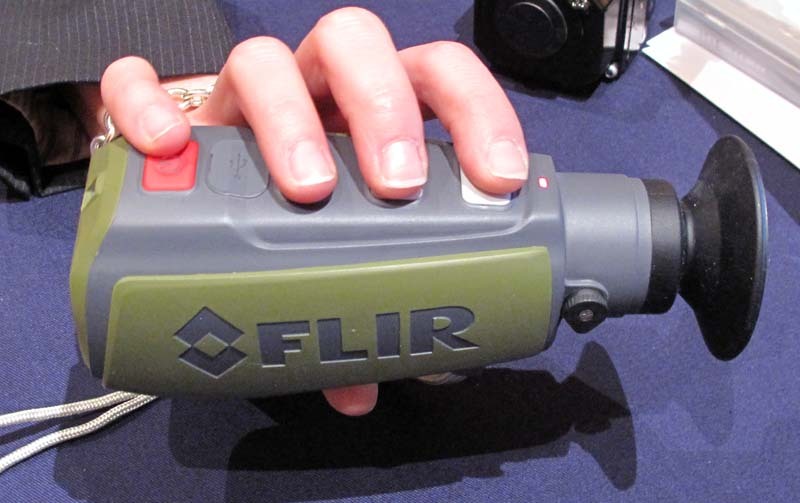 FLIR Systems has shown larger units in the past. This new one is just $2K. The Anti Sleep Pilot looks for how long you are driving, lighting and time of day to determine if you should pull over and rest. If so, it flashes red and sounds an alarm. You can also set it to "test" your response. Last product I saw tonight and I was too tired to ask the price. This was taken at 3PM on the first day of CES. Remember the scene in Star Wars when R2D2 projected a 3D image of the princess? Here is the real deal from Burton that they call Aerial 3D. They had private viewings of this display last year, but no photos were allowed. This year's version is higher quality. No glasses needed and it is like viewing an actual full 360 degree 3D object. Works by ionizing the gasses. Now you can view 3D without glasses on your iPhone. Download the free 3DeeCentral App and attach the 3DeeSlide to your iPhone and watch 3D now. For a very limited time the 3DeeSlide is free. 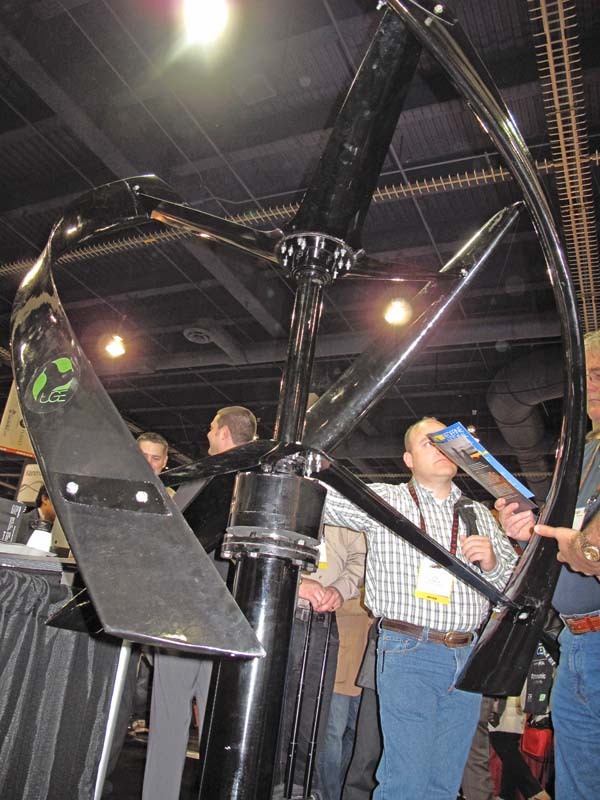 Put a real wind-power generator on your roof. 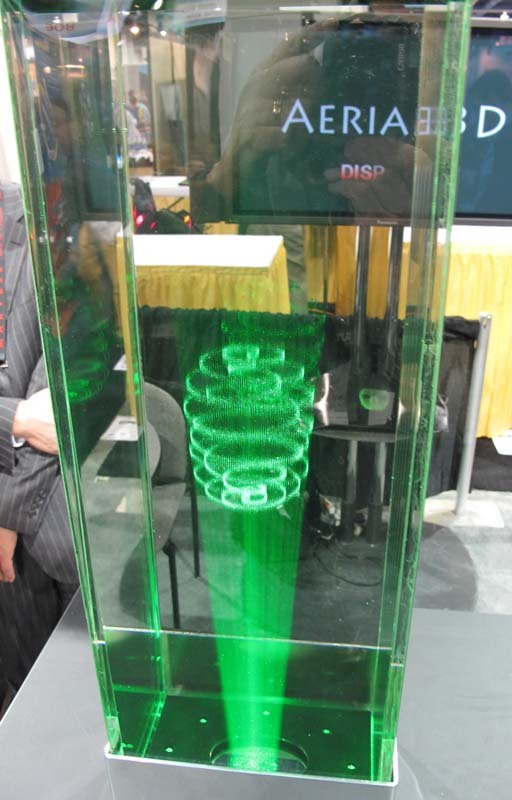 This one from Urban Green Energy puts out a peak of 600 Watts and costs about $3800. 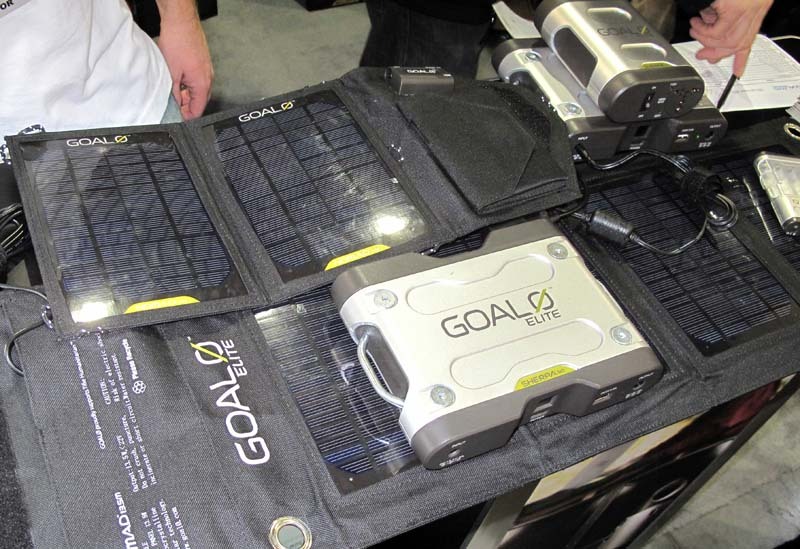 Goal0 (Goal Zero) makes a series of solar power panels and battery units that range in price from about $360 to $2.2K. Great for campers or emergencies. 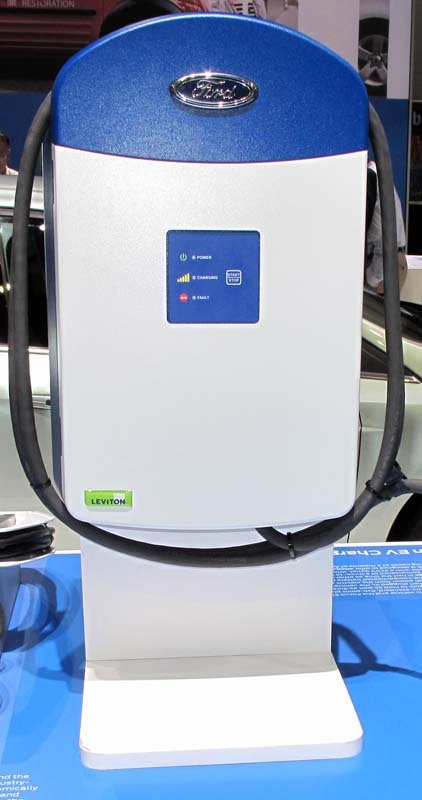 Output is to USB, 12V or full AC. 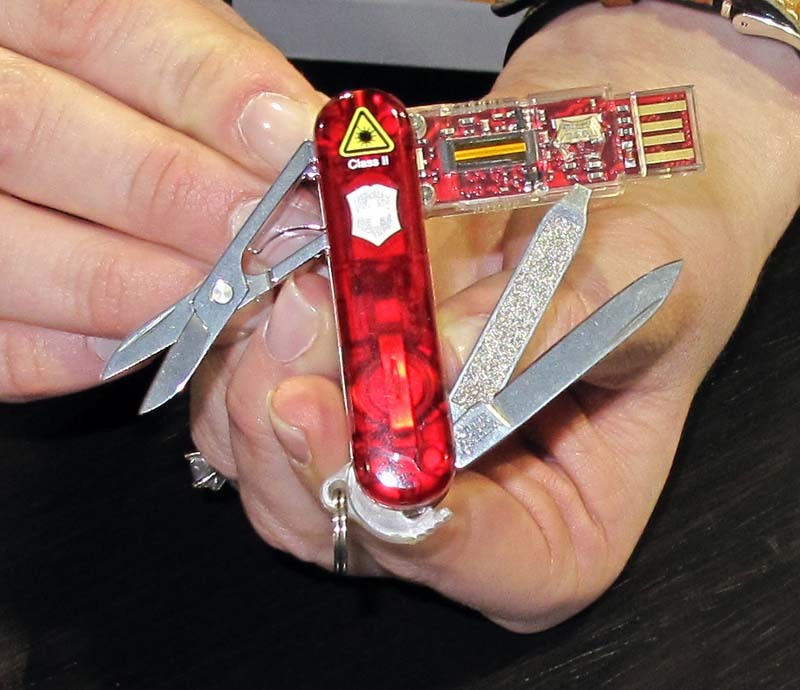 Victorinox introduced an update to their USB drive knife. Their Presentation Master contains (true to form) knife, file, scissors, 64GB USB encrypted data drive, fingerprint reader, Laser pointer, and Bluetooth link for $300. See it on their website in a few weeks. 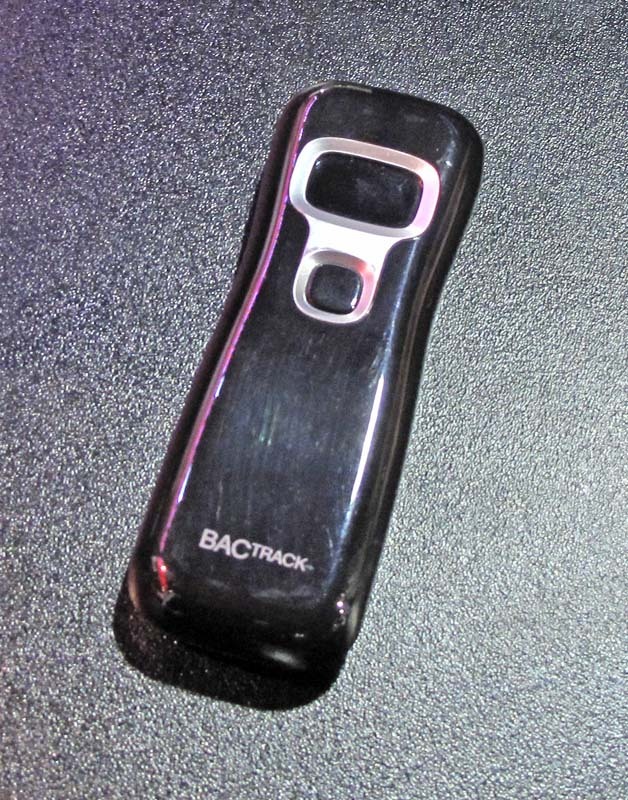 BAC Track is making money off the high costs and risks of drving drunk with a line of consumer breathilizer testers. This middle of the line unit, B70, costs $70 and is FDA approved. It can measure up to 0.4% alcohol (5X legal limit). For the person that claims to miss when life was simple and not so plastic, the Impecca KBB500 keyboard. $80-90 for cabled version. Wireless slightly more. Fujifilm has come out with their 2nd generation 3D camera/cam. This one has a number of new tricks, too many to list here, so check it out. It is the model W3 and the price is still $500 - only now they have lots of competition from other companies, so we'll see if the price holds. 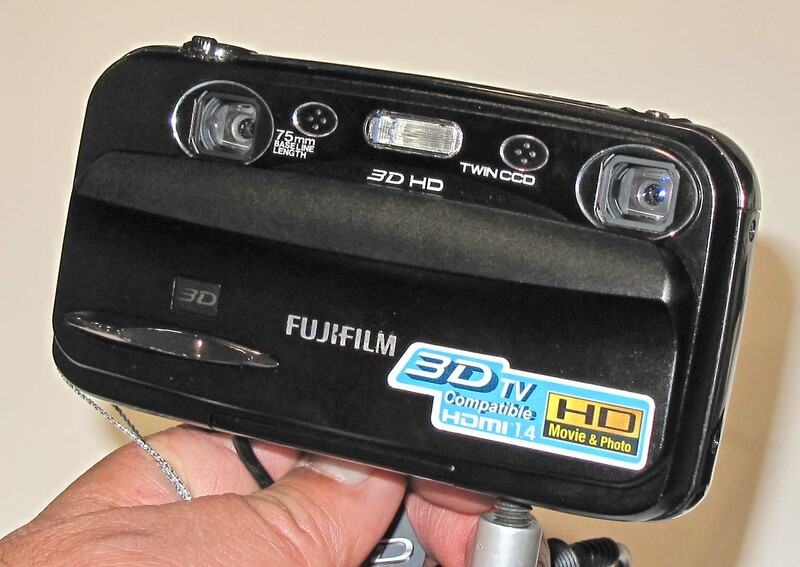 There were also many 3D camcorders this year. This one from JVC sticks out (good or bad) because it actually shoots in 2D and electronically converts to 3D (similar trick to some 3D TV). DIGDIA feels that 2D to 3D real time conversion is a gimmick. 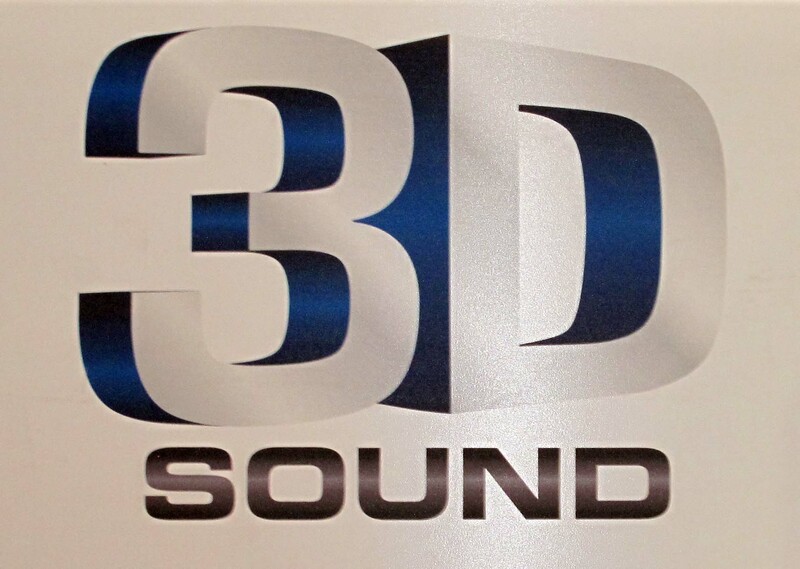 Since we are on the subject of 3D, some vendors were showing off something they called "3D Sound". Remember when High Definition was new? Vendors started to call just about everything "HD". So, it is no surprise to see several "3D Sound" signs. What is "3D sound"? Generally it refers to sound bars or other fancy speaker systems. 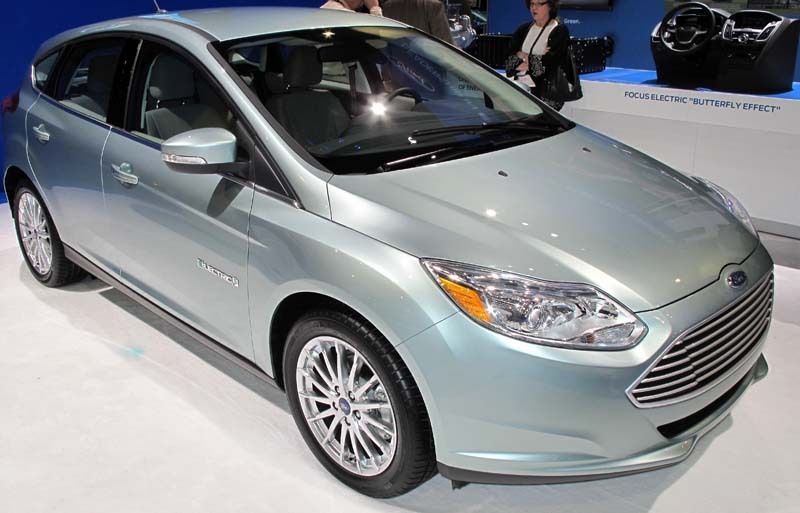 Ford's big announcement during CES was their Ford Focus Electric car. This is a 100% electric car. It has a range of 50 to 80 miles from a 3 hour charge. The charger is shown on the right. It uses 240 volts AC and Ford is working with Best Buy Geek Squad to work out home installations. The charger has Microsoft software that is used to pick the best and cheapest time to charge the car (e.g. late night instead of peak day hours). Batteries are internally cooled to optimize charging. They are designed for 10 years and 150K miles. EZSkaters.net has a different approach to electric travel. 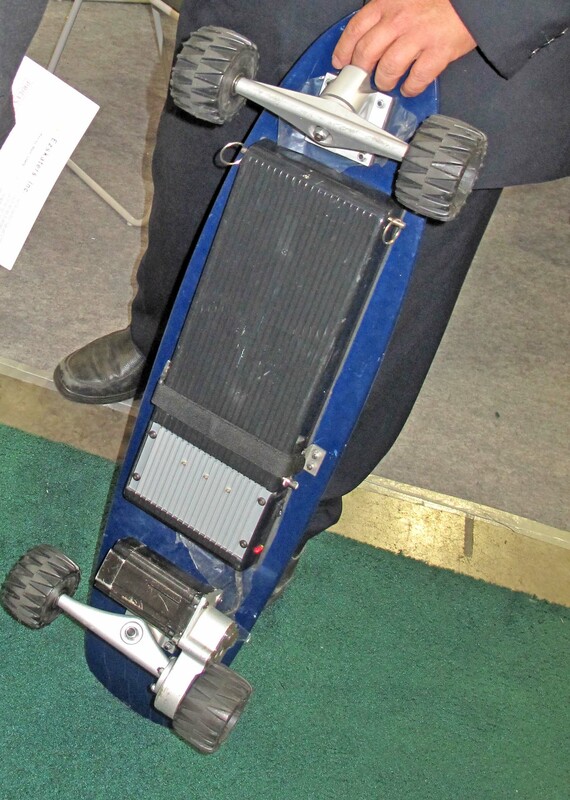 Add electric motors to your skate board. 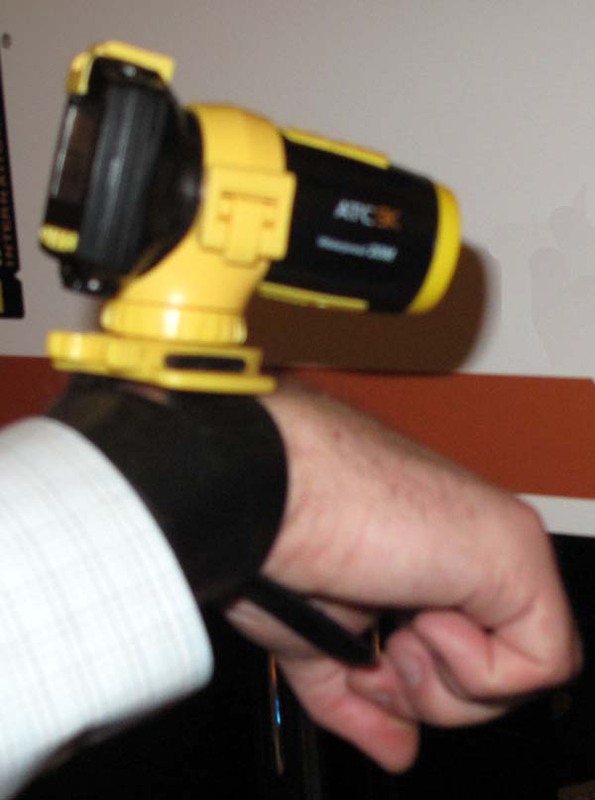 Speed is controlled by a handheld unit. They say you can get to speeds exceeding 20 MPH. Does not come with brakes. Taiwan San Tyau sells eTape. Booth person said tape measures are one of the most common household tools. This eTape reads your measurement to within 16th of an inch digitally. It has a memory button, so you don't have to write it down. $30. 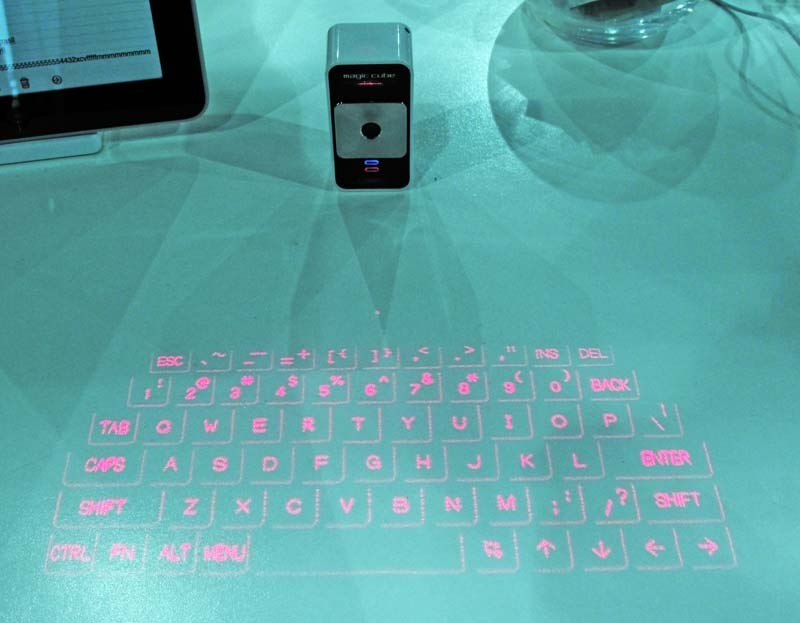 Celluon's Magic Cube is a very small device that projects a keyboard onto the table. You type on this virtual keyboard, or you can move a finger around as if you were using a mouse pad. It actually works, though you might need some adjustment. Battery lasts 3 hours. $170. Today's quiz - what is this? It is a set of speakers for your iPod. It is made by Amethyst S&D. They make several unusual speakers. The model shown is the X-1 and it sells for about $63. Seems that every year someone introduces a wearable display. We spotted two this year. This one was seen in the White Box Robotics booth. They said a price will be announced soon. You will have to guess what type of 3D video this guy is smiling about. 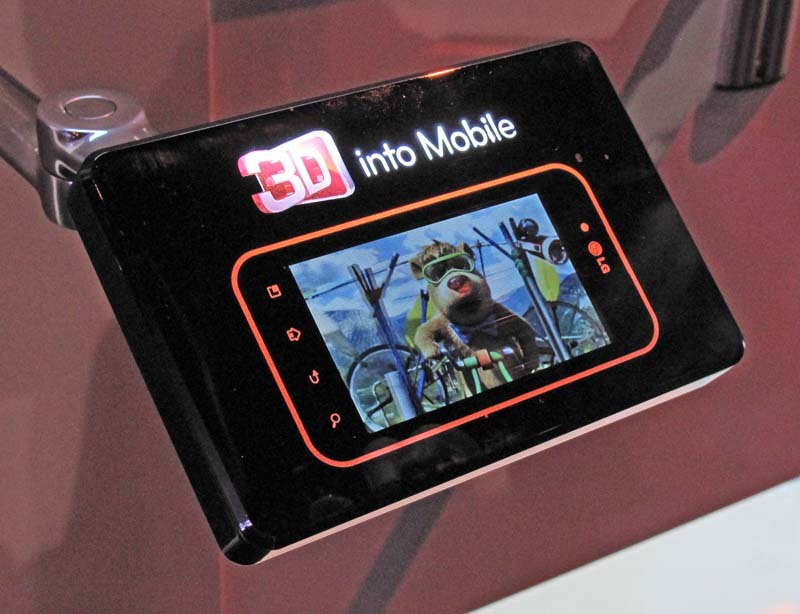 All kinds of 3D stuff came out this year (see our report on 3D Entertainment so learn more). ViewSonic seems to have jumped in with both feet. They showed 3D products in seven different product categories. Here we see their 3DVH8 3D 1080 camcorder. The monitor displays in 3D without glasses. Q2 intro - $249. 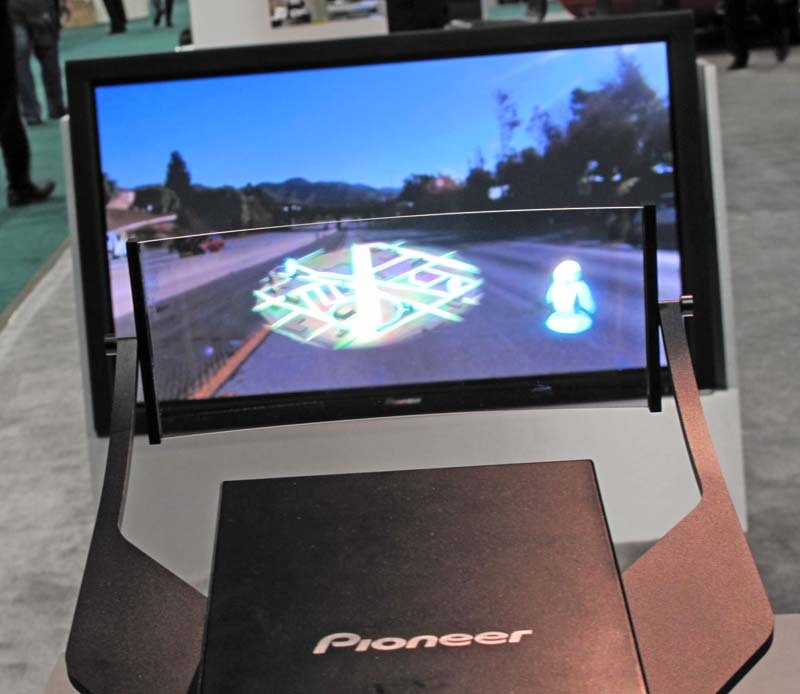 Pioneer was showing a prototype heads up display (HUD). The image is projected onto the windshield with a laser-based display system. The display, in this case, mimics a navigation map. Shenzhen Anxin hopes to sell you their "Image Attendance Checker". One walks up to this device and it tells you if it recognized you. Of course, you have to somehow be in the database already. $190. As 3D filters into the market, some people might want to look fashionable while enjoying it. Why not whip out your Nike, Lacoste, Nautica or CK Calvin 3D glasses? All of these will work in RealD theaters, as well as certain3DTVs (e.g. LG). Prices range from $40 to $200. The Mfr. 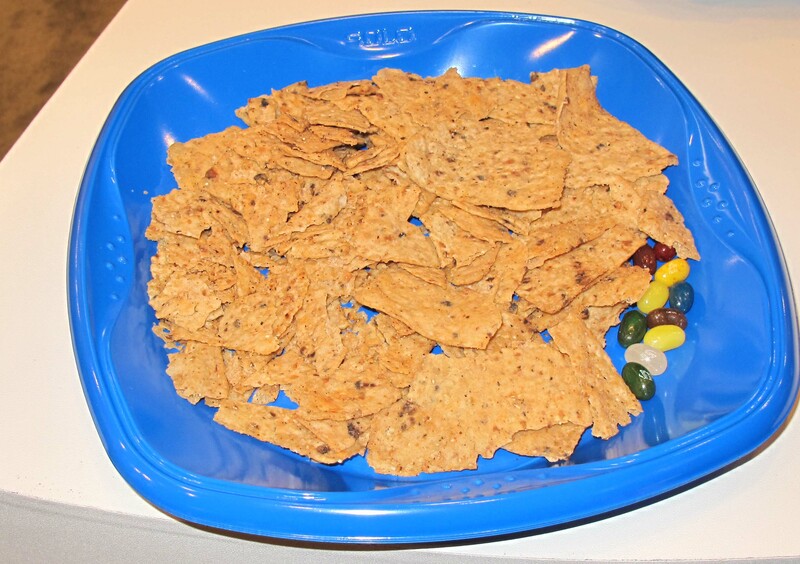 is Marchon3D Many CES booths put bowls of candy out in an attempt to attract people to visit their booth. Some conferences go as far as serving cappuccino or even real martinis. During the last hour of CES, we found one booth that had what you see to the left. Must have run out of the good stuff. 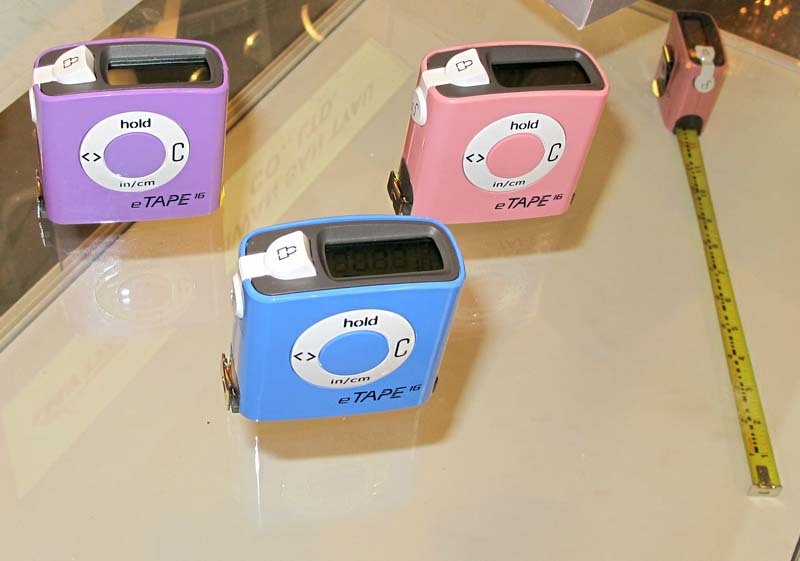 If you are not familiar with ICCE, think of it as the R&D counterpart to the Marketing done at CES. 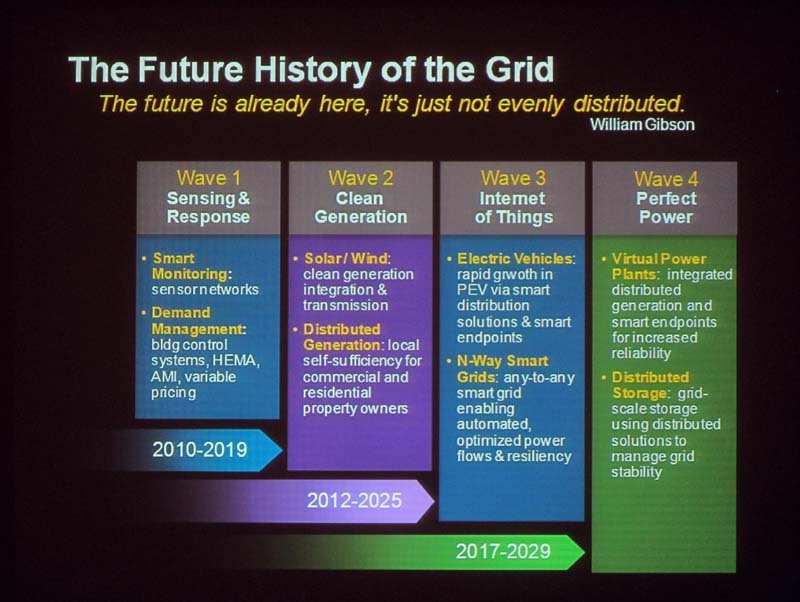 Here we have a few of the slides presented by Microsoft's Dr. Gary Sullivan. Gary has been involved in video coding and related topics for years. 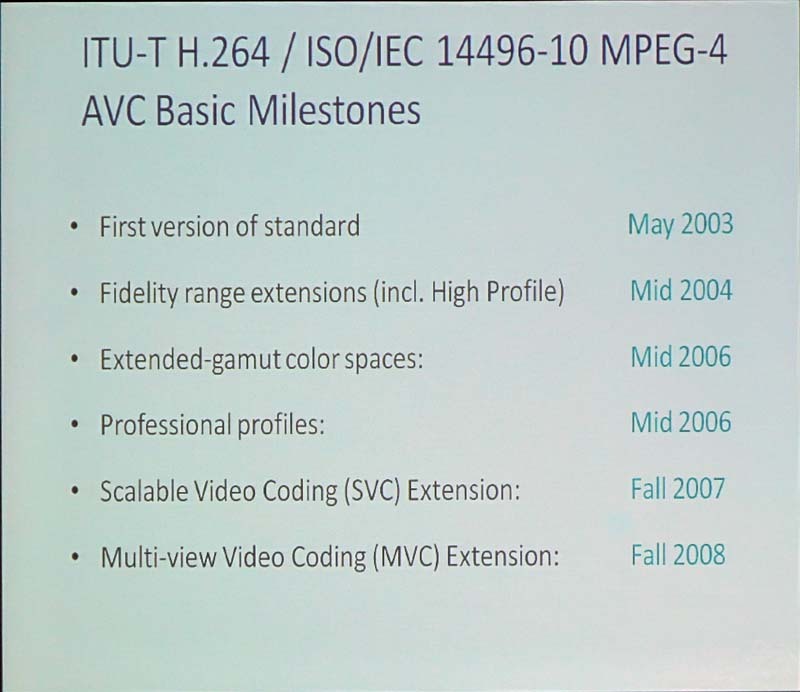 These three slides show 1) a brief timeline of video compression standards, 2) a current effort for video over HTTP called DASH (typo in slide) and 3) a new effort to upstage H.264 called High Efficiency Video Coding (HEVC). 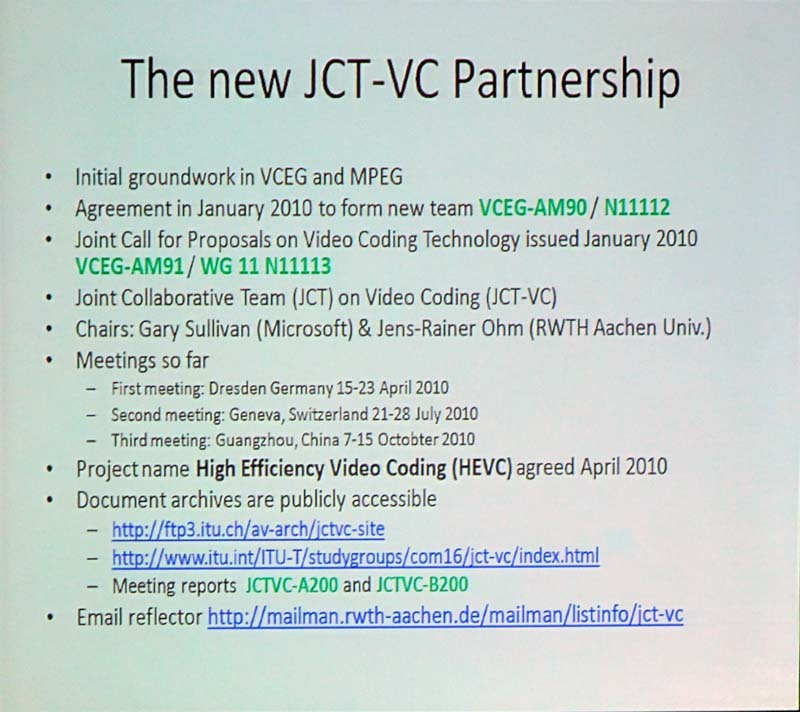 Several proposals for HEVC have already achieved 2X performance over H.264. 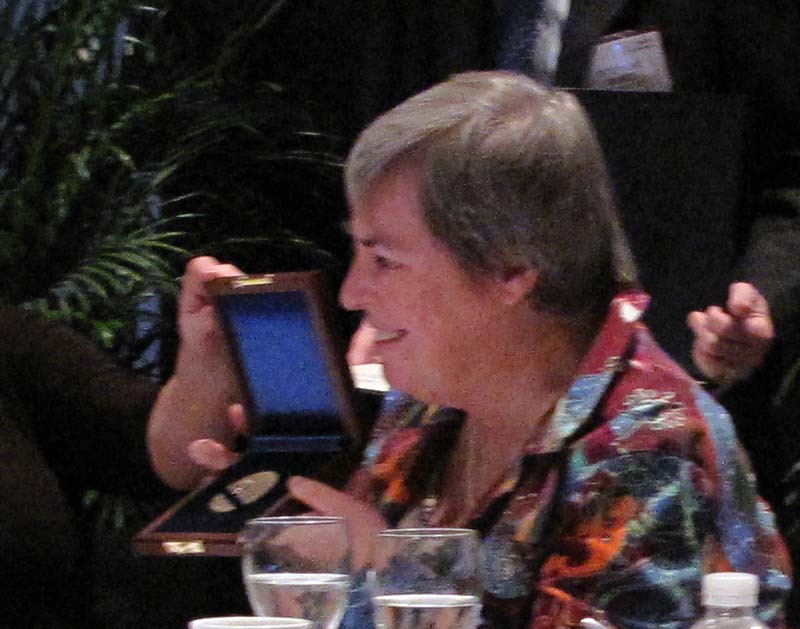 Every year the IEEE Consumer Electronics Society awards the IEEE Masaru Ibuka award to a member for outstanding contributions to consumer electronics. This year's award goes to Joan Mitchell. Joan is now retired, but was she has a long list of accomplishments related to a topic any digital camera owner should care about - JPG. Most of her work was done while she was in IBM. She was at the very start of the formation of JPG and has contributed so multiple and related topics, including MPEG, which is the foundation for the way you probably watch TV. 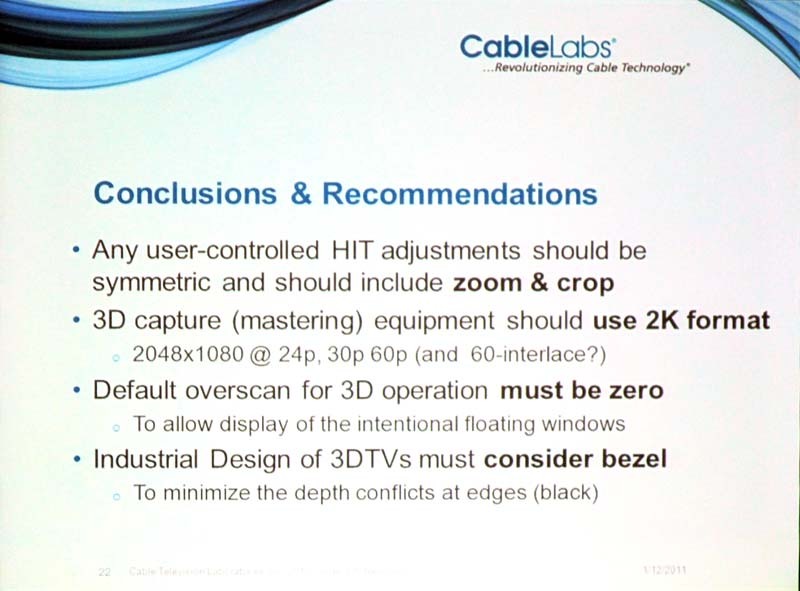 David Broberg is a key guy in CableLabs involved in helping to make 3D look good on your TV. His talk pointed out some issues that people should consider when creating 3D content for TV. 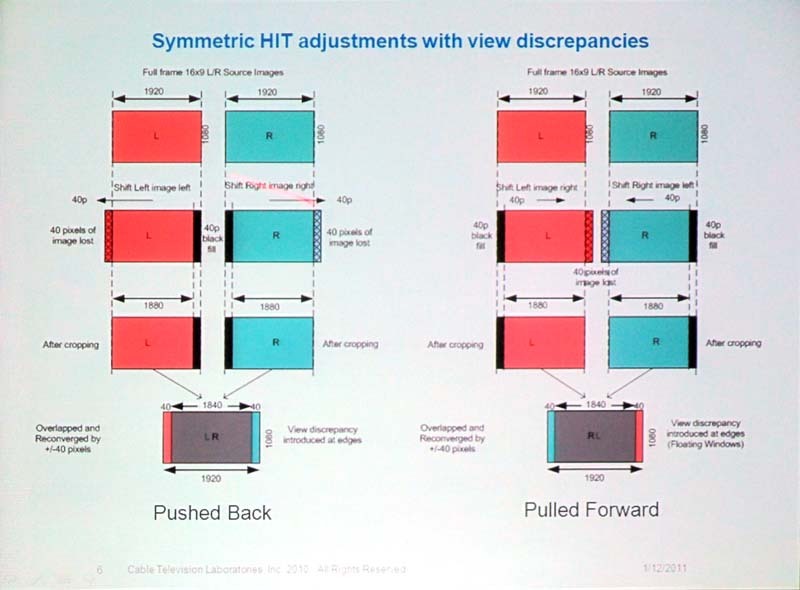 The first slide is an overview of HIT (Horizontal Image Translation), which is used to adjust apparent depth of objects. HIT can make an object look like it is closer or farther away, but it can also be abused. 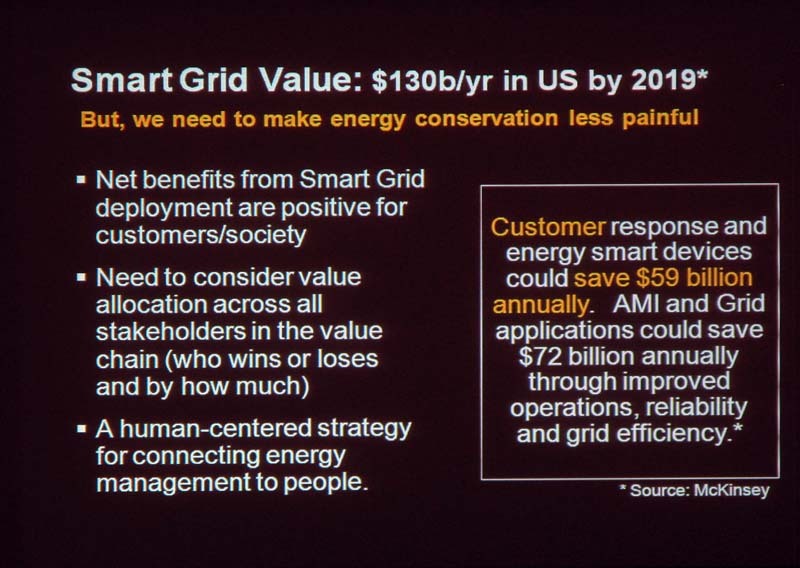 The second slide summarizes his recommendations. Among other things, David points out that shiny bezels often found on today's 3D TV set actually work against good 3D viewing.